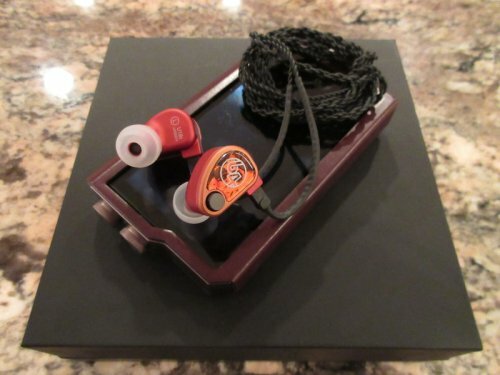 About my disclaimer...The four IEMs in this article were bought by me and I have no bias to any particular manufacturer. Irrespective of whether I was sent them free in return for my honest opinion or paid for them myself what you will get will be my honest opinion. About my opinion...Everyone has different biology including ear canal acoustics and brain burn. We have all had different audiophile careers, genre preferences and will have become accustomed to a different 'house' sound over time. We also all have differing frequencies responses as well as variations between left and right ears in some frequency areas. We will have drawn conclusions about what we consider ‘reference’ based on many factors and those can also differ. It’s for these reasons that my article is merely my own opinion and will differ from others. About my Audiophile career...I’ve been evaluating Hi-Fi equipment since the 1990's (Speakers, amps, headphones, tape decks, turntables etc) extolling the virtues of one over the other and identifying the nuances that set them apart. 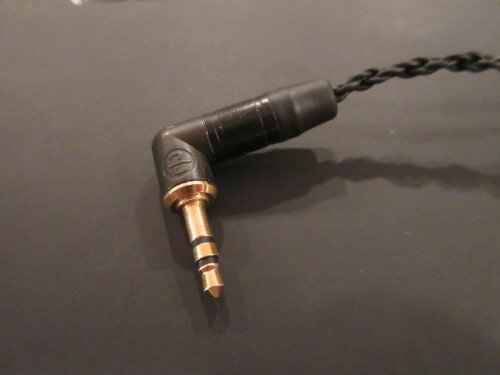 Later in the early 2000s I focused more on personal Hi-Fi equipment and was deep into IEM's for the appeal of having one’s own private performance delivered directly to ones ears to the exclusion of any other sounds. About the IEM’s selected for comparison...I explored many IEM’s and shortlisted four I liked for the purposes of this evaluation as a means of comparison. They are by no means the only considerations and there are many others I am hoping to evaluate. Most differences at this level come down to personal preferences, the shell shape and design, the quality of manufacture and the materials used and supplied cable and accessories, R & D, driver count and tuning rather than absolute audiophile dominance. The main differences will come down to individual sound signature preferences. Recommendations should not be taken too seriously. Items classified as top tier, sometimes become so due to the reviewers personal preferences or by the excitement of new ownership & brand loyalty. About EQing... We want IEMs to sound correct out of the box. Applying EQ negates the point of travelling on the audiophile journey to seek the equipment that most perfectly reproduces sound without the need for any kind of manipulation. I’m ok with selective EQ when done as part of the digital conversion phase. This kind of EQ can be achieved if the source has a biometric EQ built into the player, or if the DAC has an integrated EQ (Such as the Shure SHA900 or the Audeze Cipher cable). Perceived differences between articulation, imagery, depth, air and detail can be more closely matched between IEM's by applying gentle EQ in the right places. 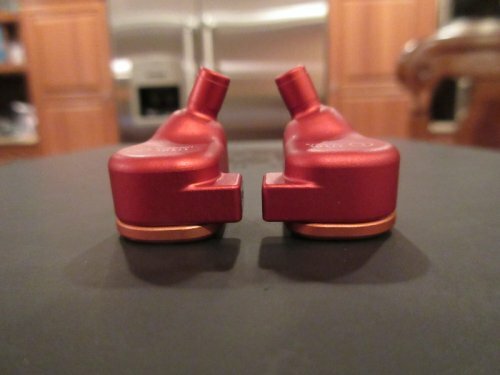 This lays bare the true differences between the IEMs. At times during this evaluation I’ve applied EQ to understand better any differences in overall timing, layering and articulation. About cables and DACs...In order to maintain a consistent set of results I have stuck with the same DAC the Shure SHA900 and sometimes the Dragonfly Red as a crosscheck. I briefly tried the Apple Lightning to 3.5mm earphone adapter cable, and the similar Moshi Integra cable enjoying good results with those with a slight preference for the Moshi. 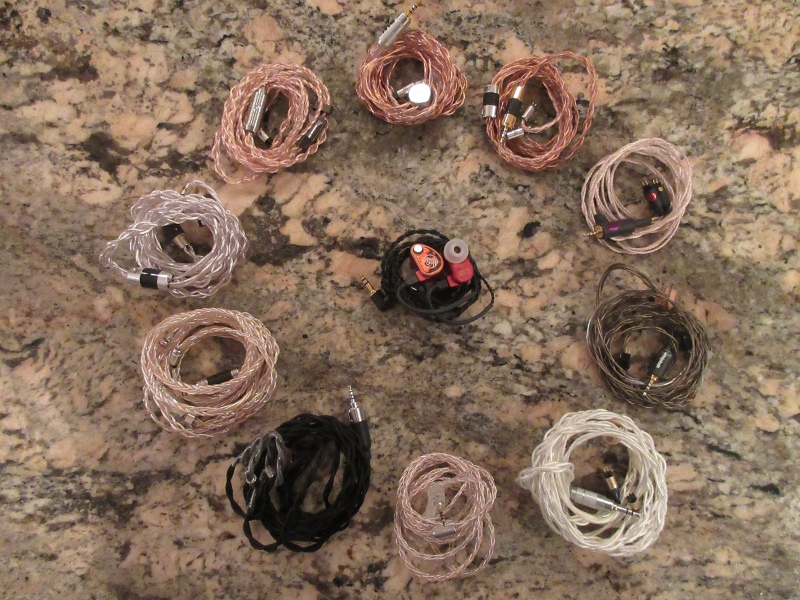 All the IEM’s have been evaluated using the bundled cables. About my source material...All evaluations are done using a wide range of musical genres including Rock, Pop, Jazz, Electronic and Classical. There is a big emphasis on Soundtrack and Classical since I find these genres the easiest to pick out attributes of the IEM. Over the years I have earmarked a selection of tracks for testing Hi-Fi equipment some of which will push them to the limits. All music is evaluated in a lossless format and nearly all tracks are 44.100khz 16 bit. About the U18t’s (build and packaging)...The U18t’s are well packaged and come complete with a protective composite case which also serves to neatly store the M20 and M15 Apex modules and cleaning tools. 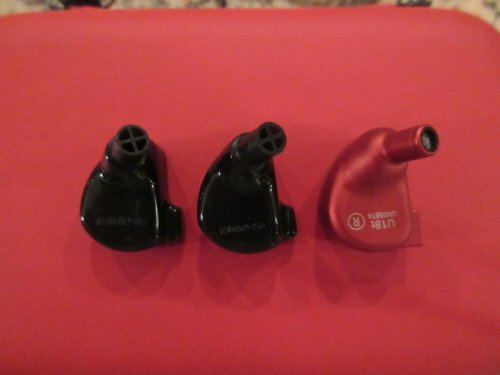 Upon un-boxing the U18t’s for the first time it was a bit of a struggle to grip the earpieces and remove them from the foam packaging material as they were flush with the surface gripping it tightly, with the foam too thick to push from underneath. There is a selection of tips to choose from, none of which I tried as I have a huge selection of tips accumulated over years and I have come to know what works best for me. The earpieces themselves are exquisitely designed, beautifully rounded for comfort and consistent with a product at this price point. It is difficult to see how they could be improved. The supplied cable is nearly perfect. It has a robust braiding in the main section which cannot be unravelled by twisting. The left/right side split section has normal twisting but the quality and rigidity is about perfect to give the sense it is unlikely to easily unravel. The cable adjuster feels reassuringly tight such that you can ‘set and forget’ it. There is a very rigid cable memory section which wraps around the ear like a pair of glasses you forget you’re wearing and the 2 pin connector terminates around a very rigid fixed plastic section which is about the right size and shape to neatly wrap around the ears. I feel the 3.5mm right angled connector whilst of a high quality is unnecessarily heavy for a cable of this type and looking at the U18t’s version 1 cable the 3.5mm connector seems less weighty. Cable microphonics is kept to a minimum for this type of cable. Overall I prefer the V2 cable for its overall build and consider it amongst the best I’ve yet seen supplied with an IEM. 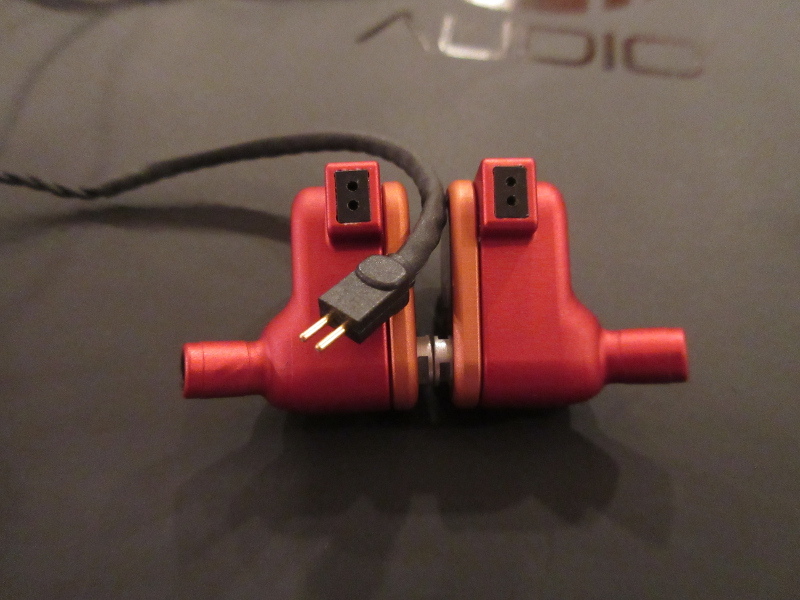 When the memory cable is positioned correctly, the inner metal of the earpieces rest neatly on the ear. 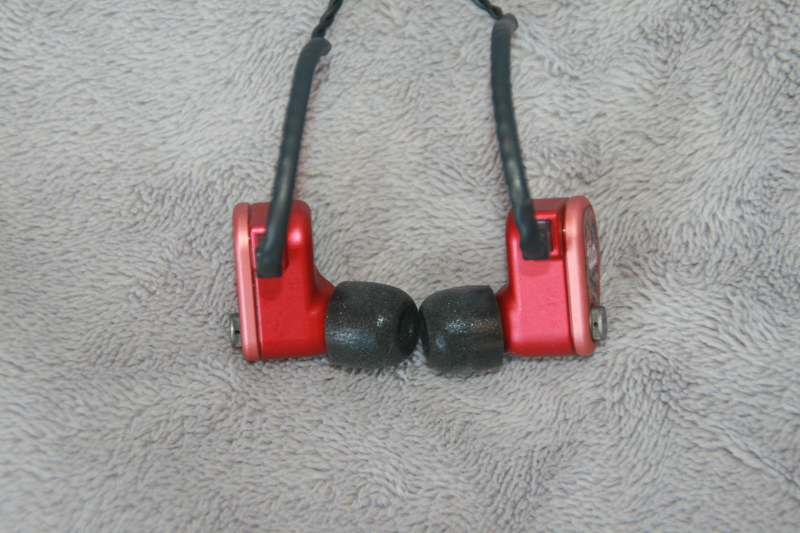 There is a slight protrusion of the front of the earpieces and the Apex modules. Generally they are comfortable for extended listening and my preferred tips were de-cored Shure Olives over Comply cores. About the M20 & M15 Apex modules...The included M20 & M15 Apex modules add an additional flexibility allowing you to slightly fine tune the sound. 64Audio explains that different levels of isolation are achieved using the different modules. I have also understood that the Apex modules are designed to reduce fatigue and pressure build-up over extended listening. 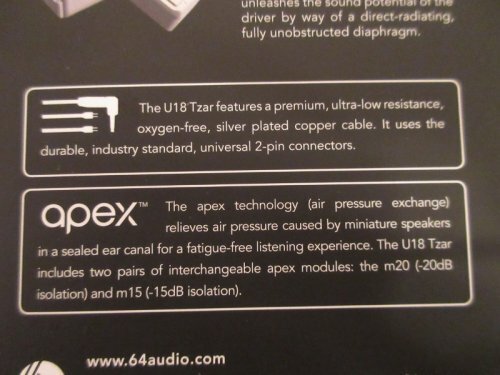 I have noted that the Apex modules do indeed work as advertised however they will not change the overall character of the IEM’s but rather fine tune them. After experimentation I stuck with the M15 module for this evaluation preferring its attenuated bass response. So what about the sound ? (First impressions)... First impressions are that they produce a detailed, airy, analytical and fast sound leaving nothing vague or uncertain in their presentation, the bass is tight and well extended to the sub bass where it has amongst the most convincing of full bodied presentations a little north of neutral. There is an abundance of sparkle also north of neutral, the imagery enables precise placement of instruments and sound effects both horizontally and vertically in the expansive soundstage with sounds seeming to just ‘pop’ into being in a remarkably magical way. The U18t’s are uncompromising with high frequency detail and seem to emphasise the overall tuning of a recording whether bright, neutral or dark. Immediately you are able to identify every nuance together with the studio or concert hall acoustics. Occasionally some tracks sound sparkly & thin with less emphasis on the mid-highs and more in the upper-highs. Rarely notes with very high frequency harmonics can have slightly bright sounding edges. There is an abundance of texture and detail, the well extended dynamic range pushing deep into the highest frequencies and beyond providing unprecedented air and shaping, particularly in acoustics and harmonics that is rarely experienced in an IEM. There is a very real sense of feeling the instruments such as strings, kick drums and canastas. The U18t’s take the music, strip and lay bare every nuance of detail that can be extracted. The mid range doesn’t seem to be lacking either; vocals are detailed but not thin sounding but not quite neutral either being slightly warmer but still with bright edging. Sibilance is there where expected and there has been no shaping to attenuate this in its presentation. Strings and brass are richly detailed and at times harsh and uncompromising. Layering is about perfect with everything sounding orderly and correct with even the most demanding of passages. So what about the Apex modules...? Comparing the sound profiles of the 2 modules I found the M20’s to have more sub-bass, bass and low-mid response, with slightly attenuated responses at the treble end upwards from 11.5k. Overall I found the effect more distinct at the low end, whereas the changes at the high end were more subtle. The M20 module reduces slightly the sense of air without altering the overall character of the signature. Overall I preferred the M15 as it sounded a little more balanced with its more restrained low end but subtle effect on the highs, counter intuitively bringing out the mids a little more. So what about after extended listening...? It takes a little time to adjust to the deeply focused and analytical U18t’s when compared to some of the more ‘relaxed’ sounding IEM’s. It’s worth it because once the ‘Brain Burn’ is complete you are left with such a transparent and lifelike presentation that you can forget sometimes you are actually listening to IEM’s. You are rewarded with a totally immersive, engaging, visceral and lifelike experience. Imagery is stepped up a level, speed, detail and soundstage, all present in abundance, thinness and brightness at times still there but more distant, with only the occasionally harshness still apparent in strings and horns in some recordings but giving every sound a clear edge and texture. So whats going on here...? The sub & lower bass are a little emphasised, the lower-mids are presented fairly neutrally, in the highs there is no compromise or trade-off around the 5-7khz to control sibilance where there may even be some slight intensity. Some slight attenuation from 8.5k until 11k possibly accounting for the occasional sense of ‘thinness’. From there upwards it seems there is notably less drop-off than any of the other IEMs upwards towards 15k and into the ultrasonic range which accounts for the abundance of ‘air’ but also the slight tizziness in some tracks on high-hats, cymbals and brass for example. This may be the trade-off required to achieve this kind of shaping and transparency. So are they Neutral...? Not far off; when comparing the presentation of the U18t’s to the other IEMs and also to room speakers, I found them closer in overall balance of bass, mids and highs than several other IEMs and also closer in overall character to floor-standers and open backed headphones like Grados. In overall balance they give some perception of neutral, however I found them to be a little sub-bass to low-mid emphasised, a little mid-high recessed and a little high-high emphasised. Overall a most compelling tuning providing some added weight, warmth and sparkle but leaning towards neutral/mainstream hybrid rather than studio reference. About the U18t’s (Overall)...64Audio have shoe-horned 18 drivers into each earpiece configured as 8 low, 8 mid, 1 high-mid and 1 ‘tia’ high, a fine feat of engineering. Like a sports car manufacturer incorporating more cylinders and cubic capacity to achieve more power and refinement. If you are the owner of such a vehicle you may not be using all the power all the time, but it’s nice to know its available when called on. But how does this translate to the U18t’s in providing a smoother cleaner more articulate sound? Well not at all really since one is an engine the other is an IEM! But the U18t’s do indeed manage sub-bass impeccably and have perfect timing and articulation with their 8 bass drivers in each earpiece. There are no issues with the mids either, sounding natural and perfectly articulate. The high-mid and tia drivers also seem to be extracting plenty of detail and even more sparkle. It is difficult to imagine how they could be improved whilst still retaining their very compelling tuning but I do find some tracks sounding a little bright and tizzy, and at times even with the M15 modules the bass can be a little hot. This surely is a symptom of this level of detail and focus that is bringing out both the best and the worst in those recordings and could be what is making them sound to me amongst the most exciting and addictive IEM’s yet. Mostly I love them for their staggering and life-like presentation with the impeccably clean bass, clean mids, airy highs and expansive soundstage. They are absolutely top tier IEMs and they have a richness of sound and refinement to match. Defining words: Airy, grand, articulate, wide, detailed, fast, analytical, razor sharp, transparent, complete. So what about the Campfire Andromeda’s? One needs to be very cautious when switching to these after extended listening to the U18t’s as the immediate impression may be one of slightly veiled highs but more rounded mids. This would be a mistake as when identifying differences by doing A/B tests any differences will be exaggerated as ones brain is identifying the differences between the IEM’s rather than an accurate ‘reference’. It is best to give plenty of time to adjust to the different sound signature before evaluating. General impressions are of an extremely balanced and well rounded tuning. There is imagery, detail and fluidity in abundance. There is a slightly more mid-centric warmth to the presentation. When other IEM’s have peaks and troughs, the Andromeda’s seem to forge a more average route through the sound signature without drawing attention to any particular frequencies apart from having overall slightly attenuated highs. The Campfire Andromeda signature is neutral to warm/mid-centric providing air, sparkle and intimacy to its presentation with no over-arching or fatiguing emphasis is in any specific frequency area. They are extremely well rounded, appealing and non-fatiguing for extended listening sessions. The imagery, timing and articulation are all excellent; sometime the sub-bass notes can be absorbed when there is a lot going on owing to the slightly less sub-bass energy in favour of more subtlety which I find to be pleasing and relaxing. The soundstage is wide and deep with a good sense of vertical spacing, high-hats and cymbals are less distinct. Sometimes the warm, smooth, silky mids can be slightly dominant and this is highlighted when there are passages involving the high-mids and treble. They deal with strings, trumpets and high-hats more forgivingly but with hardly any loss of detail. These are amongst the most balanced and engaging of IEMs. Defining words: Smooth, warm, mid-centric, balanced, natural, detailed, accurate soundstage, subtle sparkle. Comparing the Andromeda’s to the U18t’s...I found them to have slightly less sensitivity at the very lowest sub-bass registers, but then upwards of those all the way to 200hz there seemed to be incredibly even and linear response with slightly more energy between 200hz and 1k which accounts for the warmer more mid-centric presentation. The Andromeda’s followed a similar path to the U18t’s but with more energy between 8.5k and 11.5k and less from 13k upwards. This was reflected in the listening experience with the Andromeda’s sounding warmer with slightly fuller sounding high-mids and low-highs whereas the U18t’s a little thinner but more detailed and sparkly with greater air. So it would seem that both IEMs are well balanced but with the U18t’s having the more complete sub-bass and overall brighter more analytical presentation. There seems to be just as much detail with the Andromeda’s just more subtle and at times slightly more veiled when there is a lot going on. After extended listening to the Andromeda’s you could reach the conclusion that everything is present and correct and all sounds life-like and transparent. So what about the Noble Katana’s...? There is a good sense of overall balance, with a fair perception of neutral, the correct balance of bass, mid-range and treble. There is a slight low-treble emphasis. Vocals are detailed, textured and well rounded. The soundstage is natural, not expansive or intimate and the imagery is excellent. The sub-bass registers are outstanding with the perfect balance of sub-bass to bass balance. There is a good sense overall that they are bright enough. The Katana had no problems presenting and sustaining heavy and subtle sub-bass without bloating the bass or mid range to any extent. They have a well considered tuning giving a good overall sense of balance and order. There is a pleasing visceral sense to many of the effects and instruments owing to their excellent articulation, layering and tuning. Extended listening rewards the listener as they become more intimate and engaging without any sense of lacking in any area. The main ingredients are their impeccable sub bass and bass balance along with their sharp analytical but slightly more intimate presentation, subtle air and great timing. Defining words: Detailed, bold, dynamic, sharp, focused, intimate, balanced but analytical. Comparing the Katanas to the U18t’s... They are less airy than the U18t’s with a little more focus on shaping vocals and strings preferring the lower-highs to the mid-highs and high-highs. I found the Katanas to have the bass and sub-bass to lean more towards neutral and they took a different approach with the treble with emphasis on the lower-highs than the upper-highs and whilst this seemed to assist in providing more rounding and placement of instrument timbre it also created a soundstage slightly more intimate which was most engaging. There was an abundance of detail and timbre around instruments such as strings and woodwind, however the slight emphasis in this area seemed to trade off a little the sparkly end of their presentation. I think the tuning is giving a slight sibilant edge to some vocals and also providing a little more detail around strings, a signature with more shaping in the highs to give the impression of a slightly more neutral but analytical signature. Overall the presentations are quite different in particular from the high-mids upwards but both engaging. Initial impressions diminish as time passes and ‘brain-burn’ completes you are rewarded with the perception of an absolutely complete audiophile experience. When that happens everything sounds in its right place with no sense of lacking and only slight emphasis in the low-treble. In comparison to the U18t’s which feel a little quicker and have a slightly more visceral (feel) with high intensity effects, whereas the Katanas feel a little more conventional and natural but slightly edgy in its overall presentation due to its uncompromising lower-highs. The U18t’s have slightly more energy around 3300hz. The U18t’s manage to uncover a shade more presence and instrument placement, with a wider more transparent soundstage. The Katanas emphasis on the highs (but not as much the sparkly end) of the treble accounts for its analytical and detailed presentation without seeming to lose any mid range or bass response. Slightly less airy, slightly tighter more neutral sub bass, sharper more definition around the lower highs. In its approach to detail and intensity the Katanas are somewhere between the U18t’s and both the Andromeda’s and IE800S’s often sounding completely life-like and transparent but being a little less dramatic than the U18t’s but more so than both the Andromeda’s and IE800S’s. So what about the Sennheiser IE800S...? The IE800S’s pack plenty of punch at the low end with good, tight sub-bass and bass a plenty, but with real air and texture for example around piano hammer clunks, strings and bass drums are slightly exaggerated. Many will find this bass presentation very appealing. The mids are incredibly evenly presented and there seems to be some sibilance control here in the low-highs. There is plenty of subtle air and sparkle, which is more apparent in quieter passages not dominated by the lows and mids. The IE800S’s seem to have a frequency response which extends well into the ultrasonics but is sometimes overshadowed by the lows and mids. Imagery, depth and placement of instruments in the soundstage is impeccable despite its comparatively more recessed highs and these IEMs rewards the listener with extended listening much like the other IEMs. There are no issues with timing or articulation despite its single dynamic driver. The emphasised bass, attenuated low- treble but well extended highs make for a most engaging and polite experience. Defining Words: Warm, smooth, addictive, textured, dynamic, organic. 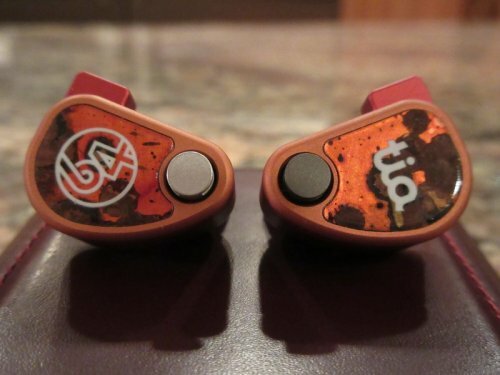 Comparing the IE800S’s to the U18t’s... The IE800S’s sound more veiled, particularly in sections dominated by mids and lows. Much like the U18t’s they have outstanding imagery for depth, horizontal and vertical instrument placement. There is less air and sparkle, and a notable reduction in sensitivity between 5.5 and 7.5k which accounts for its slightly less focused and smoother presentation with vocals, strings and brass particularly in the sibilant area. I think this shaping may also be contributing to a slightly warmer presentation around the lower mids. From 8k upwards there is an abundance of sensitivity occasionally overshadowed by the slightly more intense but well textured bass response. The IE800S’s can easily be EQ’d to reduce a little the bass response and increase a little the response between 5.5 and 7.5k producing spectacular results; however that would be robbing from its overall character of which I have come to greatly appreciate after evaluating the previous IE800 model and liking them. Note the silicon tips may also change a little the characteristics and tame a little that bass response and bring out a little more sparkle. Extended listening of the IE800S’s immerses the listener in what becomes a transparent lifelike listening experience, rarely bothered by the emphasised bass response which many will love. 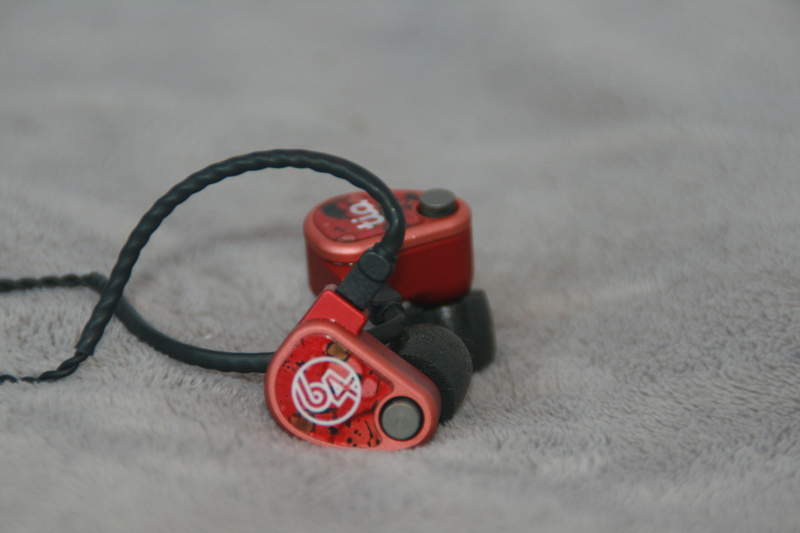 This and their clever shaping in the highs result in a most engaging and non-fatiguing sound which competes confidently with the many of the top tier IEMs but providing a more mainstream tuning. So which is the favourite...? All four are absolutely top tier IEMs I enjoy listening to for different reasons. On a sound level there is very little to choose between them apart from tuning. They all have different recipes (64 Audio U18t’s have 18 BA drivers, Noble Katanas have 9 BA, Campfire Andromeda’s have 5 BA and the Sennheiser IE800S’s have just 1 dynamic). They all deliver top levels of articulation and they can all be EQ’d to produce similar signatures bridging the differences between them. In addition all four can satisfy the demanding audiophile who patiently allows their brain to adjust to the ‘signature’ without switching backwards and forwards between them. The Katana’s are as coherent and articulate in nearly all areas but I have a slight preference for the U18t’s sound signature, larger soundstage and sublime imagery. 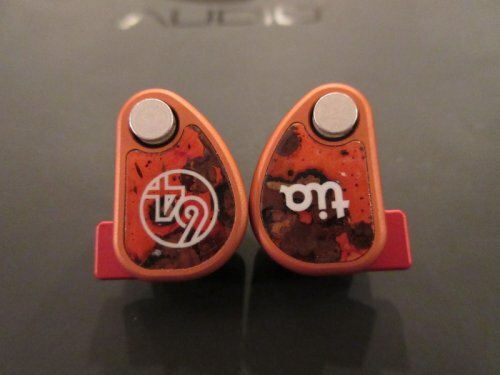 The Andromeda’s are more neutral than the IE800S’s and give a wonderfully warm and textured sound. The IE800S’s I could characterise as a slightly more mainstream tuning compared to the Andromeda’s in that many will appreciate the slightly emphasised bass, excellent isolation (with the complys tips) and the discrete design, and they are every bit as articulate as there multi-driver competitors which is highlighted particularly after applying EQ. With the U18T’s I more often noticed how vivid and real things sounded often acknowledging new ideas and textures in familiar tracks. On the other hand at times some recordings sounded thin in the highs, harsh, tizzy and sibilant compared to some of the other more forgiving IEMs. As time passed more things began falling into place with undesirable artefacts seeming fewer and farther apart, with things seeming more natural. After extended time with the U18t’s I found them to present the music in the most, engaging, visceral and lifelike manner. They force you to sit up and take notice. They evoked a similar feeling as when listening to Grado’s, or Focals in that sounds just pops into being like a hologram. This is quite an achievement for an IEM and is largely what sets them apart. I had a tough time picking a favourite and there are other candidates I could have included, however having explored the U18t’s though they are the winner for me. I feel that they are giving me as complete and refined an experience as I have yet had from an IEM more akin to open backed headphones or floor-standing speakers. There is a factor in how the U18t’s deliver the sound that has been difficult to articulate which is simply not as evident with the other IEMs and you may have noticed words like visceral, holographic, pop and texture which allude best to this. Even after ‘Brain Burn’ is completed the U18t’s are still the IEM’s that make me sit up the most taking note of the transparency. This may well be down to the ‘tia’ driver delivering more ‘air’ than any of the other IEMs. There is still room for further refinement but wonder if any adjustments to the tuning might lose some of the magic. Often you forget you’re wearing them at all imagining instead you’re listening to a high end system or live performance. A most engaging recipe I would characterise them as more mainstream than neutral. Erfan Elahi, Cheaplad, bird-loso and 18 others like this. Since joining Head-Fi nearly 15 years ago back in 2004, like so many others I have spent countless hours researching and reading reviews of different audio hardware in what is easily one of my favorite corners of the internet. Head-Fi is unquestionably one of the best places to meet fellow audiophiles, and to discover and learn about new headphones. That’s a great thing, because there are a lot of headphones out there! The sheer number of headphones and IEMs that exist makes it that much more meaningful when we encounter one that stands out from the rest, and is capable of introducing us to something new that we’ve never heard before. For many, the U18t is one of those standout products. It is truly impressive just how much technological innovation and artistry there is in the IEM market right now and 64 Audio is clearly at the forefront of it all. It takes a hell of a lot of audacity to even attempt to shoehorn 18 drivers into a single monitor, and it makes me feel a little tingly just to know that there are manufactures out there who are passionate enough to try. But knowing is only half the battle. It’s hearing that really matters. 64 Audio is well aware of this, and their slogan, “Hear Everything” is fitting to mention during this review. When you listen to the U18t, it’s nearly impossible to hear anything less. I will sprinkle in comparisons between the different 64 Audio models I have heard throughout this review. 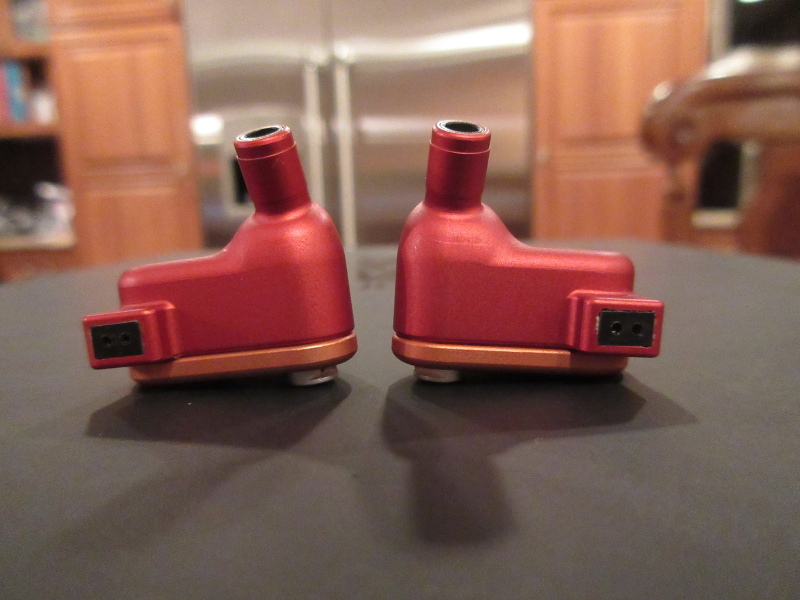 I will also draw some comparisons to my personal custom Noble K10s, a virtual sonic lighthouse around Head-Fi, that will hopefully serve as valuable reference point for many others exploring the delightfully crowded world of IEMs…what a great time to be an audiophile! 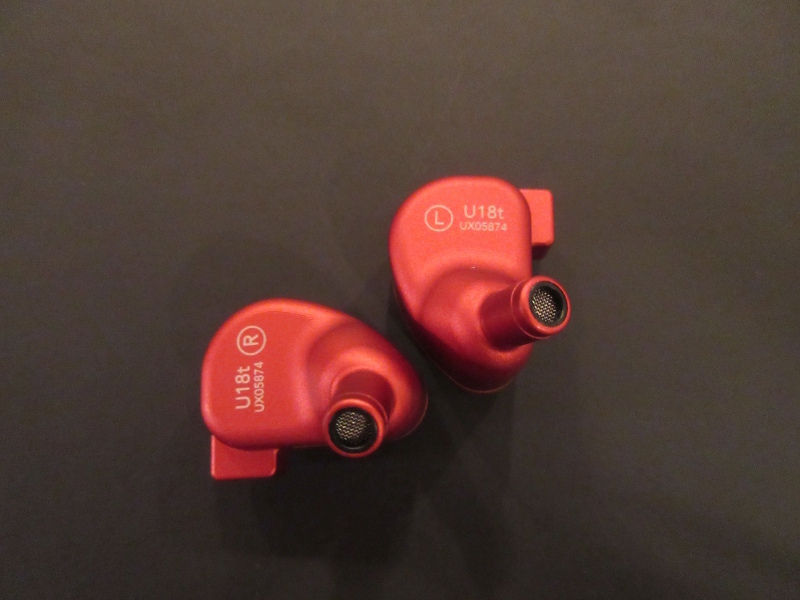 The U18t currently comes with two different sets of replaceable modules that change its sound signature dramatically. When I first saw them, I wondered how these little pieces could have such an impact, but it’s hearing that matters, right? I did indeed hear a difference and my preference tilts very strongly toward the M15 (vs. the M20) modules, and this review will focus primarily on impressions using the M15 modules. The determining factor for which modules you choose will come down to personal preference, the genre of music you are listening to, or the mood you are in. The bottom line is that having options is sweet, and it only takes about 30 seconds to swap out one set for the other. M20 – More emphasis on bass – deeper, rounder sound with more focus on low/mid impact vs. texture. Less air and high-end extension. M15 – Less emphasis on bass...but it’s still 8(!) BA drivers working in harmony to produce low-frequency nirvana. The U18t produces fantastic bass for a BA monitor, no question. There is never a time where you feel like the U18t is producing massive bass at the expense of texture and control; at all times with the M15 modules the U18t seems to be striving to present to you a sincerely balanced, detailed, spacious and coherent aural picture across an impressively wide frequency range. In the case of the M15 modules, less is more...much more. The real reason for my preference of the M15 modules is due to the way they enhance the high-end extension and airiness of the U18t’s overall sound. To me, it’s the M15 signature that elevates the listening experience with the U18t to the monitor’s highest level. 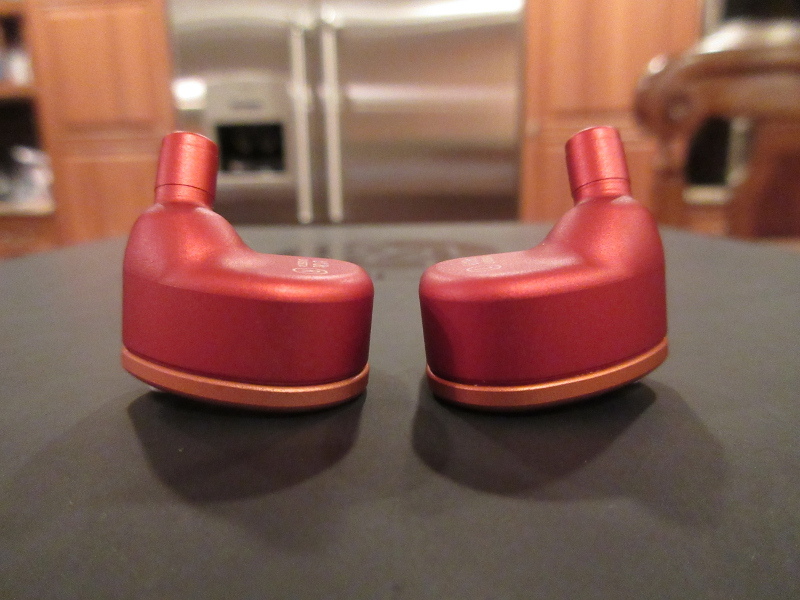 Soundstage (30%) – I do not believe IEMs are currently capable of sounding as open and spacious as over the ear headphones. After all, our outer ears do a lot to help provide us with spatial cues. IEMs pump sound directly into the ear canal leaving the rest of our ears out of the listening equation. Due to this anatomical omission, my expectations for how “open” and “spacious” an IEM can sound are less grand than my expectations vs. a headphone. Regardless of what your expectations are for an IEM, the U18t is bound to impress with its staging prowess, and the ease with which it can recreate sounds seemingly originating from somewhere far off in the distance. I’m not sure how 64 Audio accomplished this, and it’s worth experiencing for yourself. While the U12t presents a large and wonderful spacious sound, the soundstage of the U18t is even larger; just massive really, by IEM standards. The U18t’s extra clarity, airiness, and headroom provided by the additional BA drivers helps it to best the U12t, if only slightly, in stage size. 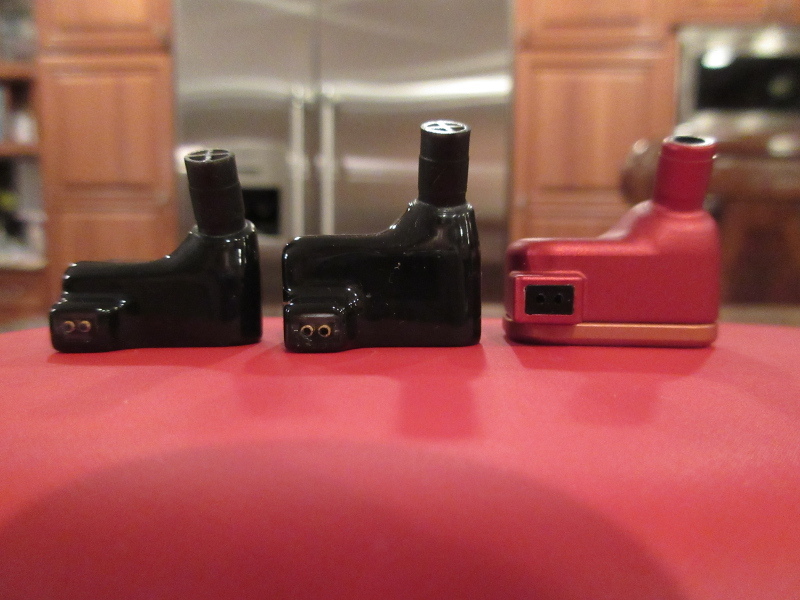 The Trio also has a large sense of space, but its soundstage is a different shape. Where U12t/U18t place you in the middle of the sound, the Trio seems to push the sound out in front of you a bit, placing you “a few rows back” and presenting a sound that is more laid back, albeit still engaging. The K10 is far more intimate in its presentation, and it also conveys a sense of space and air around instruments, it’s just not as massive and airy as the stage presented by 64 Audio. It is nice to be able to choose between a more open or more intimate stage. I remember when I first heard the U18t back at Canjam NYC earlier this year. I was listening to Mura Masa’s I Miss You at the 64 Audio table and was amazed by both the large sense of space and deep and powerful bass. A major benefit of an IEM that can produce sounds that appear to come from outside your head, is the ability to create a sense of atmosphere. I find this tremendously enhances electronic music, especially songs that are heavily layered with complex, lush sound effects. When sound seems to come from off in the distance, it also appears less fatiguing (though, this is likely just psychological as the sound is still originating in your ears, of course.) There is also a level of excitement created as you’re constantly wondering where the next sound you hear will come from. High End Extension (Tia) (25%) – 64 Audio’s Tia driver has stirred up a lot of excitement, and for good reason. It sounds fantastic. While some people have said that they are sure Tia is “the future,” I’m less concerned with tomorrow and happy that we can all enjoy listening to Tia right now. 64 Audio’s engineers have clearly been coming up with and building some seriously awesome tech into their products. The Tia driver is surely one of the company’s most significant recent achievements. The theory behind the Tia driver is that with the help of some fancy engineering, certain resonance and interference commonly associated with closed BA drivers and piping sound through tubes can be removed, and a clearer and cleaner sound can be achieved. It would be interesting to speak to an audio engineer to learn more about this, but for now I’ll just trust my ears and say that the high-end presentation on the U18t is one of the best I’ve ever heard in an IEM. The U12t also benefits from the Tia driver, however there is a level of detail and extension up top that is far more pronounced on the U18t. 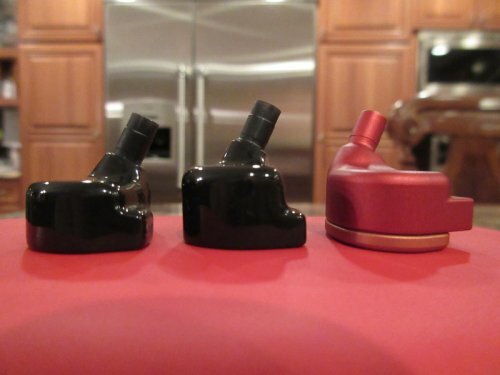 The Trio also has the Tia driver, but the highs are rounder and less extended. Again, the Trio seems to be aimed at delivering a more laid back presentation. 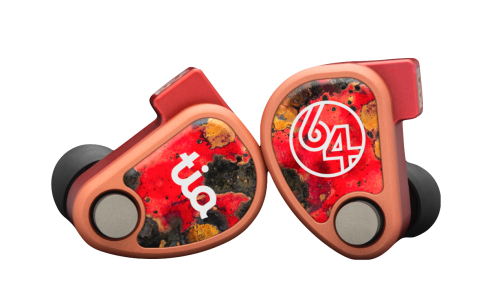 Whatever your sound signature preference is, 64 Audio has you covered. 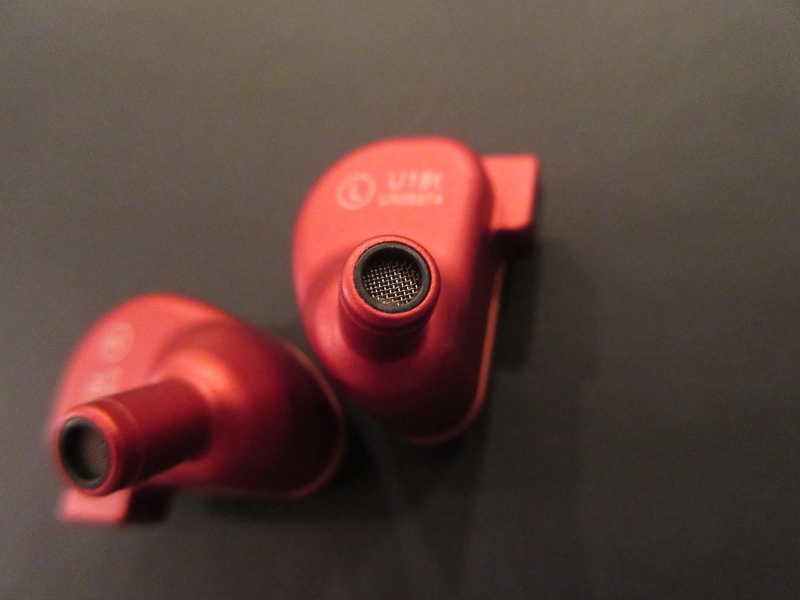 The K10 does not match the high-end extension of the Tia driver, but the Noble highs are still quite satisfying and do not appear to be lacking much detail at all. A direct A-B comparison between the K10 and U18t/U12t does reveal the additional extension disparity more clearly, but the K10 still sounds great. It’s just tuned for an ultra non-fatiguing and smooth sound up top, and there are plenty of times where that may be what you’re looking for. 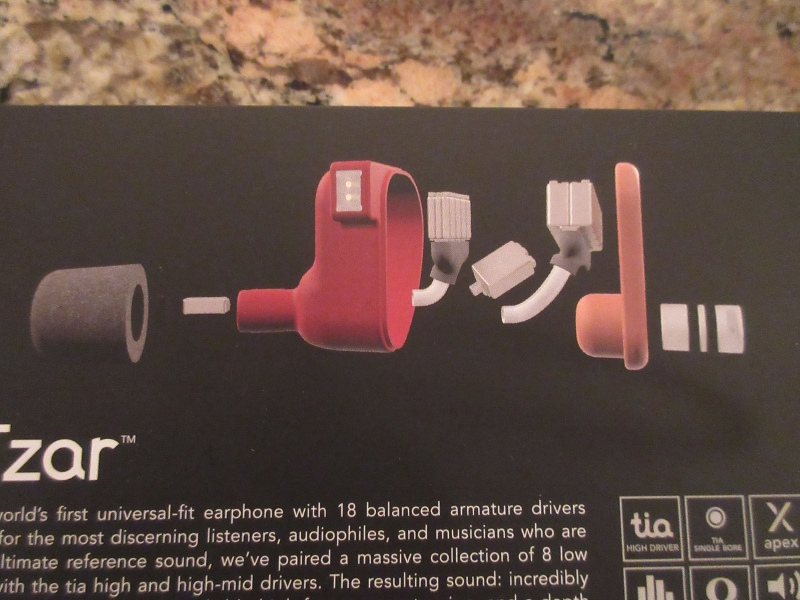 One instance when the Tia driver really impressed me was when I was listening to Tom Misch’s Tiny Desk Concert. Tiny Desk is a YouTube series put out by NPR and it’s an absolutely awesome mix of amazing artists, ranging from Tyler the Creator to Yo-Yo Ma. But it’s the format of the performances that makes them special: very intimate gatherings of the artists and a small crowd in what appears to be a library-like(?!) setting. The audio is very well-recorded, and each one I’ve watched has made me feel like I’ve had the chance to become better-acquainted with the artist. At the very beginning of the Tom Misch Tiny Desk concert, right around 27 seconds you can easily hear Misch take a breath before he begins singing. However, a second earlier there’s another sound either his mouth or nose makes just before he takes the breath. I had never noticed it listening with my K10s, but on all of the Tia-equipped 64 Audio IEMs, I could hear it. It was most pronounced on the U18t/U12t, a little less so on the Trio. But hearing this kind of detail reveals just how well the Tia driver handles and conveys subtle details in the high frequencies. Additionally, listening to orchestras with the Tia driver is a real treat. Violins sound marvelous on the U18t, and the monitor easily showcases one of, if not the best string presentations I’ve ever heard on an IEM. There is a bit less excitement present on the U12t. The Trio, with its slightly darker more laid back tuning gives up some of the sharpness from the U18t/U12t in exchange for a rounder, slightly more subdued sound. While the K10 cannot match the high-end extension of the Tia driver, (and while we’re on the subject of violins,) it’s worth mentioning that the K10 does have a wonderfully warm timber and tonality that makes violins sound incredibly life-like. This is one trick the K10 has up its bore, and one of the reasons why the K10 can still hang with some of the newest and best IEMs on the market, like the U18t. Bass Impact, Power, and Texture (20%) – Just thinking about the fact that 64 Audio put 8 BA drivers dedicated to pumping out glorious low frequencies in the U18t is kind of crazy. High-quality, deep, controlled, and textured bass is probably one of the most universally-lacking sonic traits in the world of average consumer-level audio. 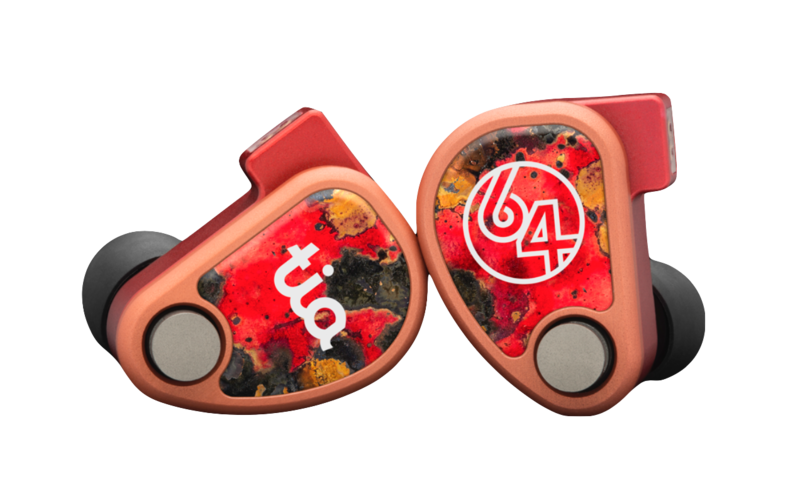 Boomy, distorted, bleeding into midrange, powerless…now, imagine the exact opposite of all of that and you’ll have a good idea what to expect with the bass on 64 Audio’s newest IEMs. Even then, you may still be surprised by the combination of impact, power, texture, and sustained rumbling capabilities of the bass when you hear it for yourself. Low distortion, sensitivity, and headroom…check, check, check. 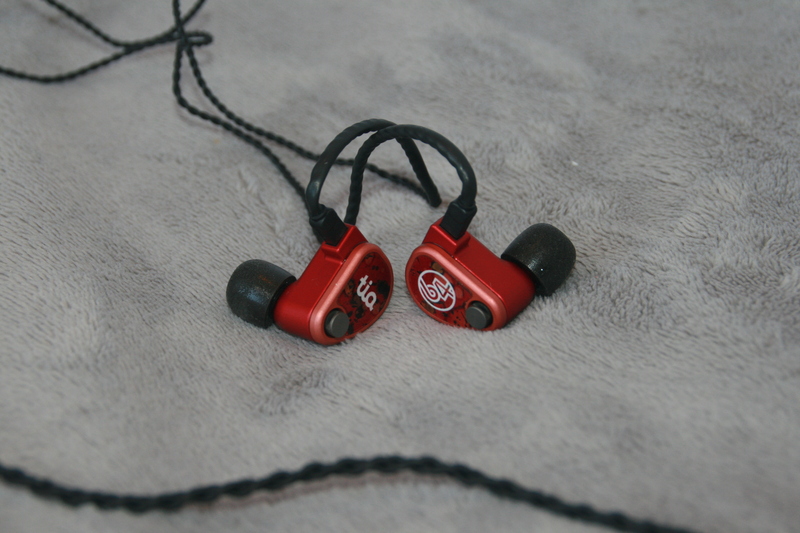 The U18t/U12t have impact, texture and power, and can both sustain rumbling better than any other IEM I’ve heard. The U12t undoubtedly has more bass quantity than the U18t, despite only having half the number of BA drivers dedicated to the deep stuff. The main difference is that on the U18t, there is an additional level of texture, refinement, and control. To be sure, bass on the U12t is still really damn good. In fact, there is no question that many people will prefer the slight low-end frequency bump in the tuning of the U12t over the U18t. Either way, you can’t go wrong. The Trio, with its single dynamic driver, doesn’t quite have the same level of speed and refinement as its wholly-BA crafted siblings. But, if you’re a fan of DD bass you’ll likely appreciate the Trio’s presentation. The bass presentations on the U18t/U12t are just so damn good, that the comparative the lack of refinement of the bass on the Trio, at least to my ears, just isn’t quite as satisfying…really, this is just a case of personal preference and 64 Audio stepping on its own toes here! Bass on the K10 is very, very good, and it’s still one of my favorites BA bass presentations in an IEM along with both the U18t/U12t. But the K10’s low-end is not quite as refined as the 8BA or 4BA bass on the U18t/U12t respectively. The K10 uses two large BA bass drivers, sort of the opposite strategy 64 Audio employed using a higher number of smaller drivers. One defining aspect of the K10’s sound signature is how generously the K10 spreads its bass and warmth across the overall sound. K10’s bass does at times seem more organic vs. the more digitally clean and precise sounding delivery of bass on the 64 Audio IEMs. These differences aside, bass presentation on any of these BA-driven monitors is extremely satisfying to me. One thing I’ve always loved about 64 Audio’s monitors is their ability to confidently produce sustained rumbling. I have yet to hear another IEM manufacturer do this better, and you can be sure that the U18t/U12t/Trio will all happy deliver aftershocks to your ears. Transient Response (15%) – Transient response can succinctly be described as an auditory “slight of hand (ear? ).” Now you hear it, now you don’t. In practice, it’s how quickly you can hear an initial burst of sound before it naturally decays. When you’re listening to a complex piano or violin solo, lots of notes are presented quickly. But, just as fast as those notes come, they also need to go. This is where terms like “lightning-fast” and “razor-sharp” often get thrown around to describe initial attack and subsequent decay. The U18t performs quite deftly here, better than any other IEM I’ve heard to date. Good transient response isn’t something that I specifically look for in a headphone. It’s a sonic trait I imagine is most appreciated by an analytically-bent listener, and I generally prefer more musicality. That said, when you combine the U18t’s transient response, the airiness of the Tia highs, the deep textured and refined bass, and the large and airy soundstage, you end up with an IEM with such a uniquely detailed sound that the detail itself actually becomes exciting. You might even also be inclined to want to learn more about what you’re hearing. I was, and the fact that listening to the U18t inspired me to further research transient response, well, that says something doesn’t it? Compared to the U12t and Trio, the U18t is definitely faster and more technically proficient in this regard, and it surely contributes to giving the U18t a slight edge in overall detail and clarity in direct back to back listening sessions. The K10 tilts much further in the direction of musicality, and that comes at the expense of some of the most minute details that the U18t effortlessly reproduces so well. Nearly Flat “Reference” Tuning (10%) – The last defining aspect of the U18t’s sound signature is its near-flat “reference” tuning. Much like capable transient response, flat frequency response is something one would expect to see near the top of an analytical listener’s wish list. The U12t, Trio, and K10 all have bass that’s at least slightly bumped, ensuring a generally more fun sound. But, by now it should be clear just how dead serious the U18t is about its mission to serve as the de facto “reference” monitor in 64 Audio’s lineup. There is something refreshing about hearing all frequencies presented with equal volume and importance across the U18t’s impressive range. And it is undeniably satisfying in being presented with an ultra-refined, detailed, and balanced presentation of sound in this way. These five aspects of the U18t’s sound are what I believe most define its overall signature. This is a monitor clearly in pursuit of the sonic ideals of “detail,” “balance,” and “neutrality” at every step. Yet, 64 Audio somehow manages to infuse a higher level of excitement into the U18t’s sound than I experienced with any other monitor in the lineup, despite the seemingly more “fun” tuning of the U12t/Trio. 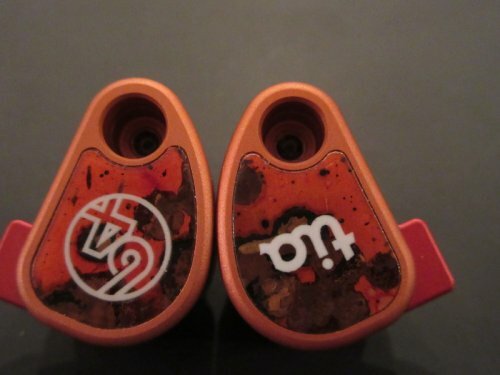 And this brings me to what I believe is the biggest success of the U18t, and why it stands out amongst such a large field of IEMs: the U18t finds a way to straddle the line between possessing a sound that is both supremely analytical and extremely musical, and does so better than so many IEMs that have come before it. When I listen to the U18t I hear a monitor with some of the most detail and analytical prowess, and yet, the U18t also has one of most exciting and fun sound signatures I’ve heard to date in any IEM. What a great time to be an audiophile, indeed. Aslshark, Piotr Michalak, szore and 5 others like this. gearofwar - have not yet had a chance to hear the aether, but would love to. I have a strong appreciation for "realistic" sounding tonality. Wonderful review! Literate, informative, usefull. I am now seriously looking at the U18t! Great review/shootout. 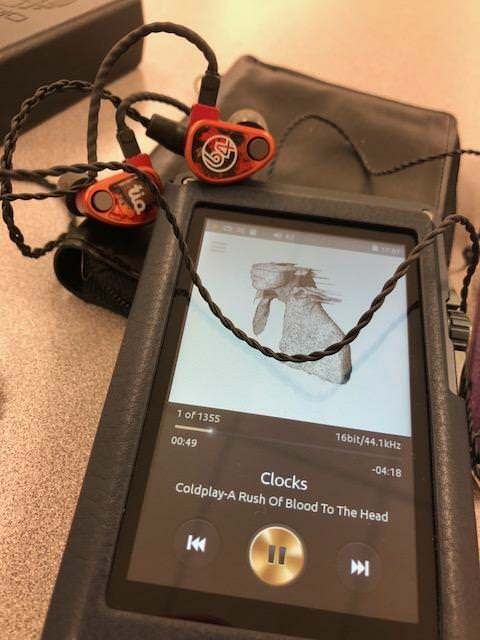 It's so nice to get honest reviews that don't start "This IEM was sent to me for review by..."
Life at the top is good, twice as good. Pros - Superb detail. Stellar layering. Incredible overall sound. A bit better bass (to me) on the Tzar. Stunning sound. 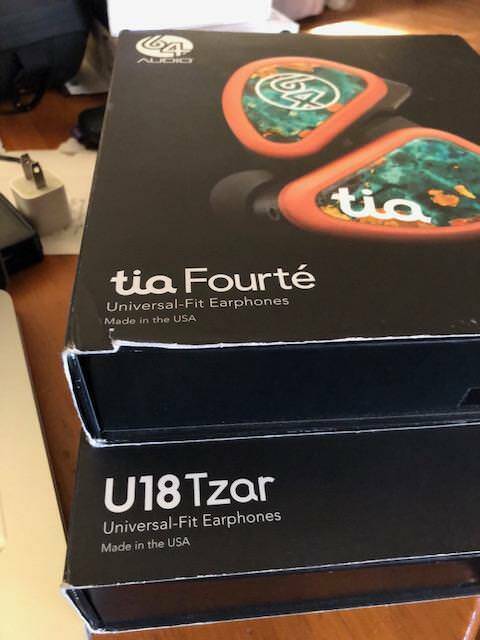 A combined review of the 64Audio tia Fourté and the U18 Tzar. Stunning is an insult. My emotional image of what a TOTL IEM should sound like has been resolved. Completely. Fully. Entirely. Wholly. Followed by the resolution that what I DO hear is so close to perfect that I do not fathom how we could go higher. Completely. Fully. Entirely. Wholly. The two 64Audio models are the best IEM’s (let alone headphones…) I have ever had the honor of hearing…period. This will come as no surprise to anyone paying attention to Head-Fi or theheadphonelist.com over the last year+. While the Fourté’s brethren the A18 placed third in the shootout, I will never be able to discern what would concert in making not one but TWO others better. My ears cannot handle it. I do not have good enough hearing to discern the differences between 1st & 3rd. That said, I CAN hear the difference between the DITA Dream (luckily also on hand), and my Unique Melody Maestro V2’s. Maybe discern the difference is a poor choice of words…decide WHAT or WHY 1st & 2nd are better would be closer to the truth. And truth is in the eye of the beholder. My son, Pinky & I had a mini-meet a couple of weeks ago. In conversing beforehand, he asked what he should bring for me to hear. The emoji I sent back, was that smary sideways smirking look, which said really??!! That said, I did politely ask for the Fourté, knowing he had recently picked up a pair and was smitten like a teenager looking at his first, well….never mind about that image. Strike that, please. Pinky cordially obliged, bringing many other fine wares to peruse. He wanted to try my Maestro’s, having only had a brief listen in the company of Lawrance at a meet in St. Louis. I was more than happy to return the favor. 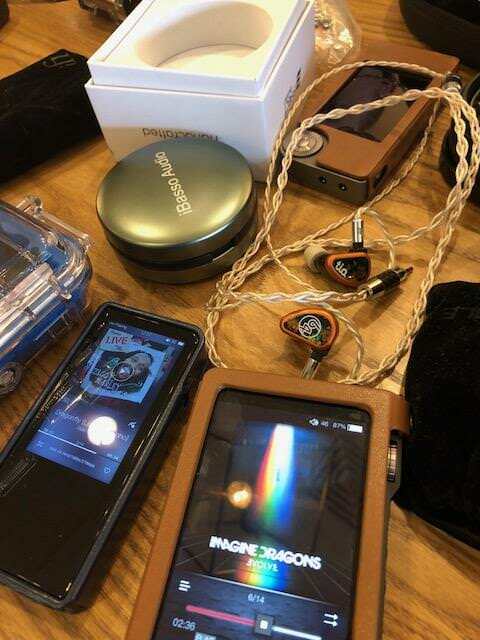 Many other listening devices were on hand, including his Cayin N5ii (which he held away from me in a death grip), the iBasso DX200 he had on hand, as well as my personal Shanling’s, both M3S and M5. A cornucopia of listen bliss was had, and this only heightened my anticipation regarding the 64 products. I will admit that we like a slightly different signature, so the devices were tailored differently than I would. That said, he did point out that the Opus#2 (which I held in death grip) was not running any EQ settings. The pair was magnificent. Stunning is a hyperbole used quite a bit for audio products. Stunning does not begin to describe the nirvanic sound piercing my ears. An intoxication of the type, where I almost had my son drive home…almost. He refused giving ME that smarmy look, because we were in the Prius. So, I had to sober up on “lesser” gear. Which I will add was damn fine listening. Fast forward to the day. I was only able to listen briefly to assure the tour peeps, that all was well and good, and copacetic in 64-land. It was. My first full day is actually today. And I am not disappointed. Driven through my M5, this is Zenith material. I cannot stress this enough. This is not hype. This is Lamborghini Veneno territory of IEM’s. At this point in time, there are only 1-2 competitors with which to compete (in my mind…). Maybe a better comparison of the top three would be the first episode of The Grand Tour, where Clarkson, Hammond & May finally do get the McLaren P1, Ferrari LaFerrari and Porsche 918 Spyder together in that epic Hypercar shootout. Throw in the Lamborghini and you have that foursome and you could easily label the four I have as those above. My goodness we do. Another positive from that mini-meet was a search in earnest by me for a wonderful Opus#2. Hearing that wonderful device made me a believer and gave me the push to dive in and find my own...it is in route as I scribble. The pair will be back together very soon. So, as luck would have it, I have four wonderful units with which to listen for a short time. Even the few days together allowed me appreciation of company’s vision regarding their TOTL IEM. A joy it is to participate. Pretty irrelevant, since as usual I’m late to the party and everyone has pretty much described what sounds good or what they used with this critter. I did listen to a variety, trying to cover many genres. Needless to say, they ALL sounded good. I was able to give a dedicated listen to the Fourté for several hours. I wanted an uninterrupted session, since that would probably be the only time I could. The airiness with which sound is presented is otherworldly. There is a reason the Fourté had the best resolution of this group. It is incredible. An interesting history of the usage of Audio Resolution can be found here: https://en.wikipedia.org/wiki/High-resolution_audio. To me resolution is sheer definition. To have something so precise and perfect that everything is in place. No mistakes, no misplacements, no errors whatsoever…and this to me is a very strong point, one that cannot be underrepresented. That said, showing overly-detailed response can be antithesis of what some want. Here, it is the perfect melding of sound signature, imaging, sound stage (almost, Maestro V2 is marginally better), timbre and any other audio terms you would like to throw in. Only in separation does the Maestro beat this vaunted unit. And to my tired ears, it really is a push. I would consider the Fourté on the same level as a Hypercar such as the Porsche 918 Spyder. It may not be the fastest, nor handle the best, but it is the quintessential melding of all to form the package, which does what you want, when you want. The Tzar to me has better bass sound, and slightly better control of that bass. If I had to make one change to the Fourté, that would be it. In fact at this current moment listening to Bob Marley, on the Tzar, I prefer that signature to the Fourté. The Tzar is an incredible critter, in it’s own right. Consider the Tzar the Veneno of the group. 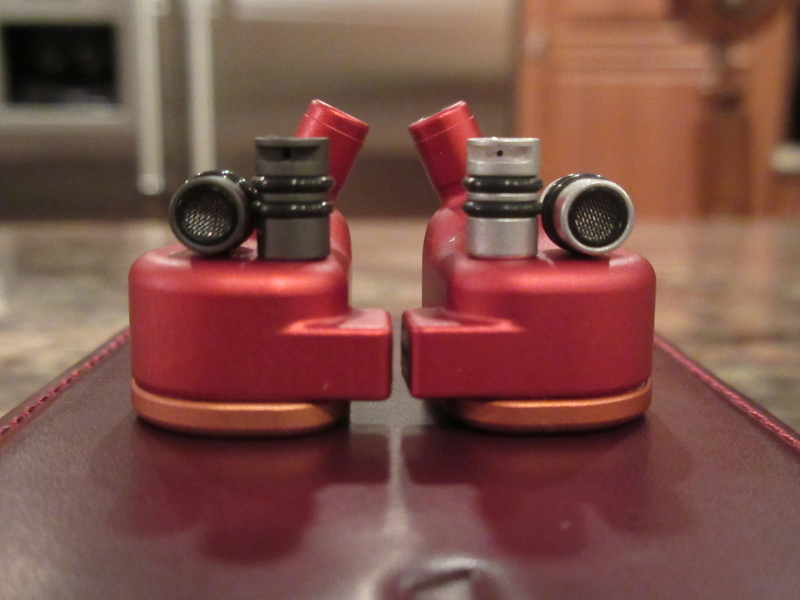 I lush superlatives on the 64 Audio pair almost to the point of love. Well…yes, because there is nothing I have heard IEM-wise that is better. Some come close, but to me this IS my pinnacle so far (a point I mentioned in not only my Pinnacle P1 review but also Vibro Labs Aria reviews, eons ago…). I have heard nothing better than these two. @Faithguy19 warned me that I had better get the DITA Dream listening done early, because once I heard the 64Audio’s, they would not come out of my ears. He is absolutely-almost correct. What good would that do me, if I did not compare to what others I had worthy of inclusion? So he is correct, you do not want to take the 64’s out, at all, ever; but must in order to bring/restore your sanity and depth of perspective. Especially when you have other fine wares in hand. As stated above, the Tzar’s are wonderful on their own. Many on the tour thread extoll the virtue of the Fourté, but neglect the Tzar. Recently on a Facebook thread, someone posted how he was awaiting the arrival of his Tzar. I will have to go back and congratulate him on an extraordinary purchase, well because it IS. In fact the longer I go, the more I appreciate their tuning, and prefer them to the Fourté. Wait….wait a bloody minute! Did this loser just state he actually prefers the Tzar to the Fourté??!! Blasphemous! Plagarous! Ridiculous!!! Incredulous!!! Hippopotomous!!! Well, yes, I did. I did in fact say that. Taking the Tzar out of my moldy ears, I replace them with the Fourté, and hope to explain. As incredible sounding as the tia’s are, they are too bass shy in quality to me. That does not mean the bass, which is there is poor sounding, far from it. Rich, engulfing and crystalline clear it is. But there just isn’t enough of it for my tastes. I have moved to where I prefer not to EQ anything, and if I had the Fourté, I’m afraid I would have to do that. And yes, I have sufficient amperage in modular units, that would allow for that “deficiency.” From the first moment I put the U18T into my ear, I fell in love. Not the love I feel for my Maestro, no that is pure unadulterated love. A love, which could best be described as longing. Like that perfect vacation where you KNEW right away, you would come and retire once the time is up on your occupation. A place you dream about, which guides you towards that destination. A place you think of often, and will attain eventually. Much like Lake Superior and my soul. A place I hold so dear to my center, that it drives me. This is how I feel about the Tzar, as I listen to Dave Matthews Gravedigger. Then of course I put the Fourté back in, and while the sound is that crystalline clear of a -30 degree Fahrenheit day, cloudless and snow gleaming, it lacks that feel. That finished touch of when the snow and wind and vivid possibilities come about during the storm. That is the Tzar. 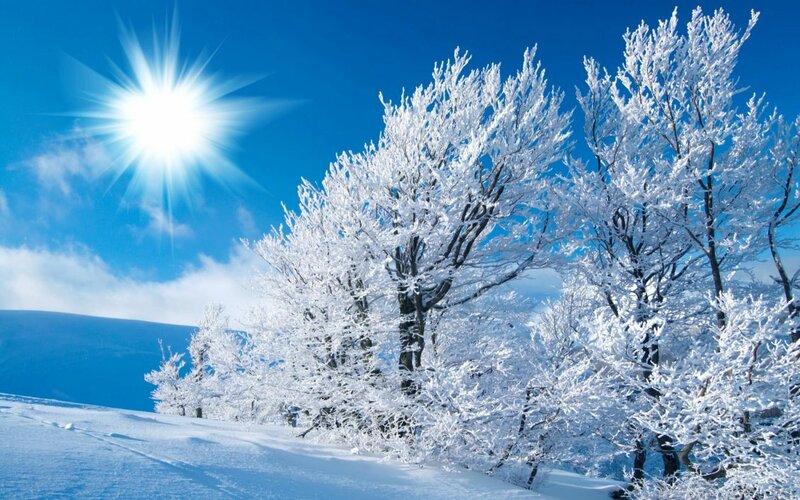 If the Tzar is that wonderful and possibly life-threatening Superior winter storm; the Fourté is the crystalline clear afterwards, where everything is perfect. Not a sound, but simply beauty in that silence. And, the Maestro is the lifelong companion I would want along for that ride. Warm, inviting, excellent of tone and separation, it is a vivid reminder of what one can have for less than ½ the price of the others. Not a compromise at all, but the companion you cherish wisely. And I do. The layering of the Fourté is beyond repose. It is exemplary as you can separate each layer of music and tone completely. The same can be said for the Tzar, but with a bit of a darker tone. One as stated I prefer. This would be that perfect Dagwood sandwich, well thought out, but ultimately for our consumption and well worth the thought. The build of the 64 products is exemplary (as it should be…). Presented in a fairly plain container, they took the approach of the product matters more than the container. I would concur. Included is a humidor-like container with which to display the critter. My only qualm here is that the cable is wrapped around a split “post, “ rather tightly. While it works, I would almost spend for a Pelican, and throw in the desiccant. Included tips are few with three of foam (REALLY nice ones and silicon), plus most at this purchase would use their preferred tip, hopefully after trying out many. I did use the foam Comply-like tip because that is my tip of choice. Matching the sound I prefer, a darker warmer sound, the foams provided me with that outlet. Not much has been said regarding the Dream. All focus has been upon the 64 pair for this aspect, but I will add that the Dream with the Truth cable is well worthy of inclusion into this quartet. A wonderfully Germanic-type build is the stellar star platform on which a very, very good IEM is built. Bass of rumbling quality, surprising to be honest, the DITA would be that McLaren P1 crashing the above party. Somewhat raw to drive (ask Hammond…), but worth its entry in gold. With a bass note driving very good resolution, separation and imaging, I do liken the Dream to a Panzer tank. Built to withstand the enemie’s ultimate charge, it can be defeated. You simply need find it’s weak point. Not easy to drive, and a bit thin of sound compared to the other three, it is good in its own right. Mid range detail is superb to me. Tying together with the exuberant bass, the Dream can be that expensive pair you throw into the gym bag. It is built that well. 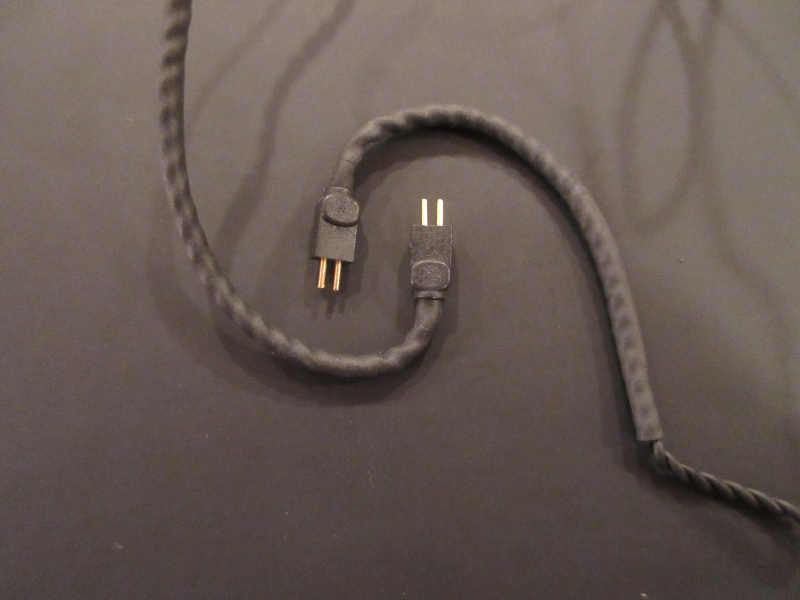 And while I appreciate the addition of a $499 cable, designed by VanDenHul, it is a PITA to coil and keep straight. Unforgiving and constantly coiling that is enough for me to dump it in favor of other special cables. Held of its own, and after adjusting away from the 64 products, the Dream comes into its own. That polite thinner sound can draw you in because of the details presented. With excellent to me treble sound, hearing that guitar pluck of David Gilmour makes the Dream sing. Faltering a bit on the piano staccato, it is still all well and good. This is the morning coffee pair, as you look over Lake Superior on a summer’s day before the wind has picked up. Enjoying that solitude is most definitely not to be missed. But for the rest, you will need to finish over on my Dream review. This one is for the 64’s. I find the SPC cables a conundrum for both of the 64’s. Plain, simple eminently coilable they just work. And you know I like things that just work. It is a testament that sometimes a simple item just proceeds, without getting in the way. Once I figured out how to run Tidal on the Opus, I listened to both the Tzar and Fourté for the evening exclusively on Tidal. I must say, that the combination of the Opus#2 and Tzar was stunning. A level of detail I had not fully understood came about and right knocked me back. This was a very good combination, with excellent detail retrieval, separation and imaging. I would state that the soundstage did suffer a smidge, but I have never been one to quibble regarding soundstage. It has been two days since the pair left our humble area. I had all but forgotten about them, only realizing that I need finish this review whilst I listen to the next project…and I do reminisce about that sound. I can still (imagine) remember the level of detail in which the Fourté took me in completely. To me, the defining point of an exemplary unit, that detail allows all, completely to be heard the way the musician intended. Every note, every fault, every nuance heard, and laid naked the way composer meant. I vividly recall the bass, which drove me to like the Tzar more. A bass, which I rate up as some of the best quality/quantity ratio I have heard. I was enthralled when I heard it, and am still. If people did not demand products of this cost, then they probably would not be manufactured. Kind of like that Hypercar foursome mentioned above. If demand did not warrant, then they might only be engineers dreams….wait, who am I kidding?! It is BECAUSE of those impassioned engineers that we can give ourselves that luxury. Those darn engineers and their deep-thinking cranials gave rise to some of the most sought after and vaunted automobiles ever. The same can be said of the 64’s. And I for one am thankful for that memory. Think of where we would be had Enzo Ferrari not envisioned his marque. The world just might be a whole lot more boring places to live. I for one am glad that we can cherish and embrace the Enzo’s of this world. I thank @64Audio for this incredible honor, and the faith they have shown the Head-Fi groupies. And, without @Barra managing these tours (he be a busy boy!! ), it would not be possible. Aslshark, bird-loso, Number9redreD and 2 others like this. U18 - The tzar's majesty. 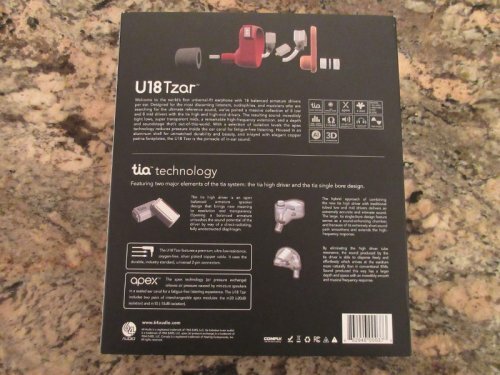 Using the UTzar18 gives you a sense of 3d space that can only be described as life like. Over and again I am consistently impressed with its sonic abilities. Subjective experiences are hard to share as we can often be quite different from each other. That being said, I will make an attempt here. Before I do I wish to make clear all testing was done with the m15 module with large spiral dots as that was what I ultimately ended up preferring sound wise. I've been able to try the Tzar18 in a number of configurations both with my LG V10 acting as a direct source, as well as my main rig, the Venturecraft Sundroid Valoq 627sm(with and without the Nakamura headphone conditioner). Additionally, while testing different sources, I've been fortunate enough to add in a prion4 cable to test for my own self to see if I would personally find validity to others claims of sonic character changes. Test tracks consisted of 16-24 bit FLAC consisting of various genres. Besides music I also tested with anime as a references for shows and audio entertainment not music focused. As a reference and bit of background I tend to prefer somewhat balanced and neutral signatures with the slightest bit of warmth in the bass and a fairly linear balance of mid to trebles. I currently own the MEE P1 and think very highly of them for their price to performance. 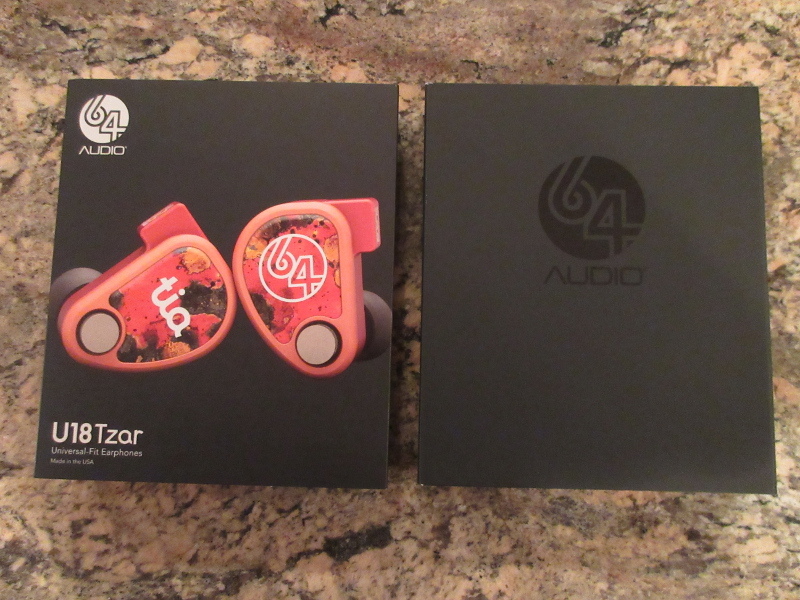 The headphones come in a very smooth box that first had me thinking with first impressions that 64audio, know and understand how to sell a product that already stands as a experience waiting to happen. This wasn't a simple pelican case with stuff placed inside. There is a presentation that should be expected at a price level like this and the build quality reflects this. As shown they are very nice in appearance and pop to the eyes thanks to the combination of color and emblem. The housing is sturdy and cable quite acceptable, though, as I go into later definitely benefits from cable rolling. Using the original cable and LG v10 at first listen barring my main rig, was acceptable. If I had never owned anything else I would be a happy camper all day. That being said, I've been fortunate to try a few units over the years and know it can be so much better for someone. The dac inside the LG V10 is alright for what it does and should get props for really changing things for cellphones and recognizing what was once not considered before (the audio community at large). That being said using the Tzar18 out of the LG quickly shows it do not stand up to the task of being it's source. Call it bad synergy or my preference for sound but it's flat, in the sense of depth and sound stage. Any sense of depth is lacking and the life of the music, any music you listen to comes of dry and lifeless. Needless to say I didn't continue my audition with this pair for more than a couple of days to give the pair a chance and my brain/ears a chance to thoroughly understand what was being relayed. Using the headphone conditioner did little to improve any of the players faults. Switching to my main rig showed more favorable results. With the Valoq, more is able to come through thanks to a much better design more focused towards sound from the ground up. Separation, 3d spatial cues and body come through where they were lacking previously. The player excels greatly with its pitch black background lending to a crystalline presentation that is as once precise yet inviting. Detail comes through in spades with the Valoq never slouching in the face of this giant. This pair does a great job building a space with intimacy immersing you in details and bass that are balanced and clean, yet full and with texture. Listening to the album Open Your Ears and starting with the first track gives chills as the acapella group steps in to give their combined performance. The absolute black background presented as the backdrop, the distance between each individual singer, and the timbre in every voice is very clear and holographic in its presentation. All elements of fuzz, ticks, and the nuances sprinkled throughout come through crystal clear. The vocals are dripping with toxicity and are downright seducing with the harmonies between the two female vocalists. They may as well be mermaid on land seducing men to their deaths. Bass has punch and everything seems to have its place with no frequency over stepping into another's domain. Childish Gambino's Me And Your Mama from 2016, Awaken My Love is what I use for all out bass performance up to the 2 min mark Bass texture is visceral, full with impact and body. Production is tight and really shines with this pairing. Sub bass demands your attention and refuses to let go of its hold till the music segue ways into a different direction. Micro details like stars in your eyes. I use this to see if a particular pairing just steals me away. I'm not so much critically listening as I'm just letting go. I find myself melt, taken into the velvety background of that overshadowing synthesizer. Pulled from my corpse by the pull of the beating of the drums reveals infinity, were all one. This is my critical listening with the snap of the cymbals, the confident walking bassline, and sax being all too visceral. The band plays beautifully and is presented as if they broke into my house and decided to start serial assaulting my senses with all that is smooth and cool. Unforgivable, thank you. The few things I don't like about these headphones are the price, though with the 18ba configuration and outstanding quality of sound attributed to the tia drivers. I could see some justification if there were more to the accessories and a additional cable in balanced ready to go. I did not love these as well for anime/shows that I like to watch as I found the fourte to do better when it came to overall extra body for voices and situations be it explosions and the like. Further the nozzle was an issue I had. I felt that they were too long to benefit the spiral dots that I wished to use. Utilizing a small pair of buds backwards, I then attach the spiral dots, which help to further round out the sound and add slightly to punch of bass. Additionally while the included cable was fine and of good quality, the prion4 elevated what was already there. 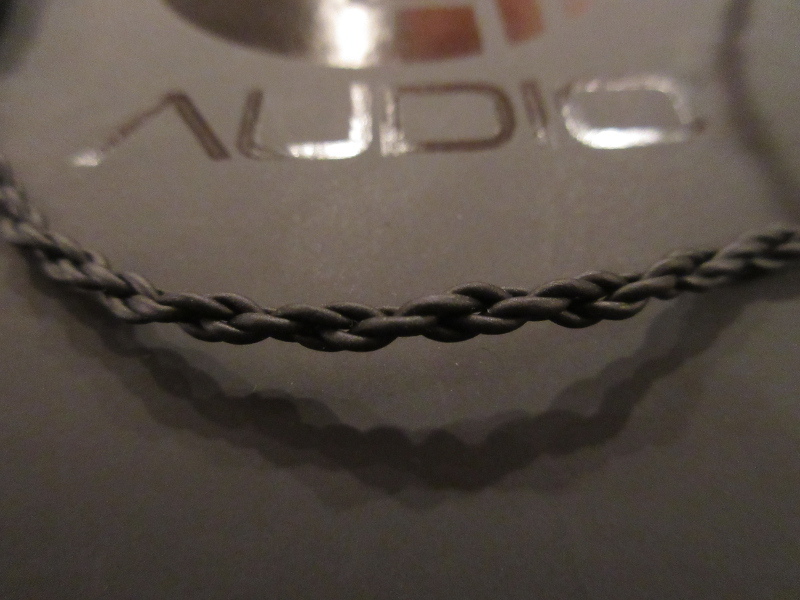 This cable had a very nice quality of providing a cleaner sound, that's not to be taken as sounding sharper or leaner. The qualities allow everything from bass texture, the snap of cymbals and hi hats and even vocals all to come through in a more detailed and extended manner that is a kin to having perhaps a curtain between you and a performance removed when compared to the original cable. If you have poor recordings you'll be able to pick it apart and come away dissatisfied. On the contrary, if you have a great setup be prepared to be blown away. Kudos to 64 audio and thanks to @barra for organizing the tour. Aslshark and junix like this. Pros - expanded transparent sound, coherent tuning of 18 drivers, resolving balanced sig, two apex modules with different sound sig, custom storage case, quality stock cable. Cons - price, more eartips wouldn’t hurt. What is the next logical step after reviewing U6 and U12? According to my calculations it's got to be U18, 64audio latest flagship with 18 BA drivers. Some people are probably going to think that 64audio decided to open another chapter in driver wars, but once you get a chance to hear U18 it becomes clear this is a TOTL flagship with an impressive multi-driver coherency and not just another marketing stunt. Actually, I was thinking how to start this review with introduction of U18, and decided there is no way to avoid an elephant in the room. When 64audio made the announcement about their upcoming U18tzar, I wasn't sure what got more attention, the fact it was the first universal 18-driver BA or its MSRP price. This not only applies to 64audio, but also to many other manufacturers when introduction of the new flagship opens a door to a discussion about the price. In my opinion, it just makes no sense for the next gen enhanced IEM model to be undervalued and priced the same or lower than a previous flagship, otherwise your customers and the audiophile community will not take your product seriously. But it will certainly raise a question if the increase is reasonable? My reviews are typically neutral with a focus on what I hear and how I hear it, as well as how it compares to other products in the same category or pairs up with different sources. It's exactly what you should expect from this write up as well. But I did start it differently, unlike my U6/U12 reviews, because I felt compelled to address U18 pricing in lieu of many of my readers talking about it. To be fair, only the manufacturer knows the material cost, the R&D resources, and the labor and production cost associated with a finished IEM. As a consumer, we take into consideration the price of the previous flagship and the new design changes on top of it. In case of U18, there is an addition of 6 more drivers, including a unique open BA TIA driver, a set of two APEX modules (M20 and M15) with each contributing to a distinct sound signature, a new SPC stock cable tuned for a better synergy with U18/Fourte, and the all new slick aluminum shell with a single bore design (to accommodate TIA driver) - even smaller than their previous universal U12 shell. When you factor in all these updates, it can give you a new perspective on U18, so you can shift your focus from the pricing to other more important things this new flagship offers, the things I'm going to cover next in my review. U18 arrived in a large box, a lot bigger than a compact packaging I got used to with U6 and U12. Their previous packaging box was about the size of their new custom travel case used with different A/U models. 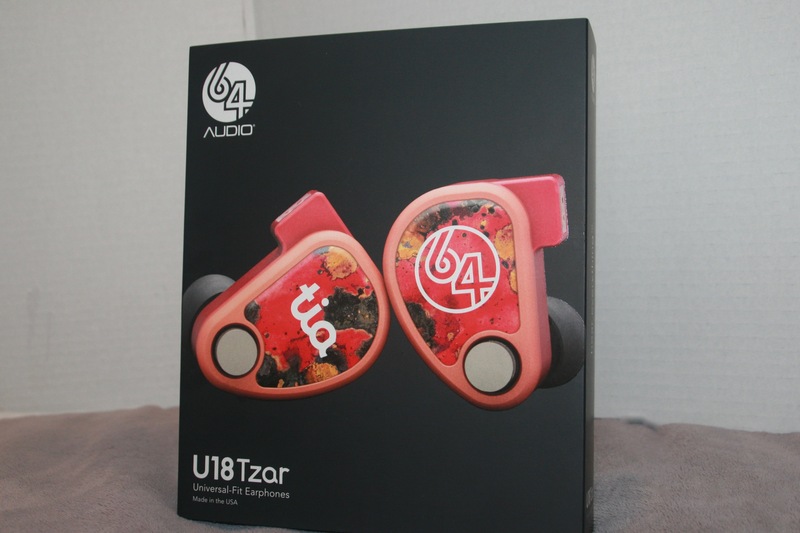 Here, 64audio decided to do something different, making the box noticeably bigger to have more room to showcase a glossy, nearly 3D hi-res image of U18tzar shells popping out from the cover of the sleeve wrapped around the main box. When you flip it over, you get a lot of detailed info about U18 with a CAD drawing of the inner guts, the philosophy behind the design and the sound, and the spec in thumb images with a corresponding description. 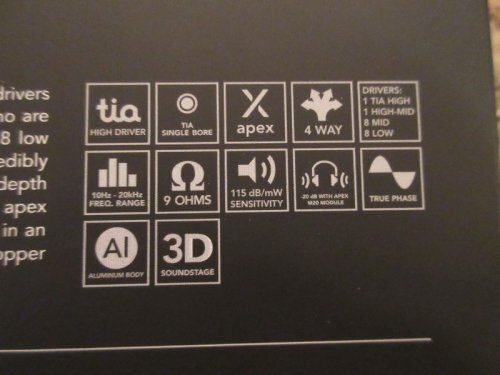 Furthermore, there is info about 64audio TIA technology, covering open back driver design, and a detailed description of the inner shell and the driver placement. 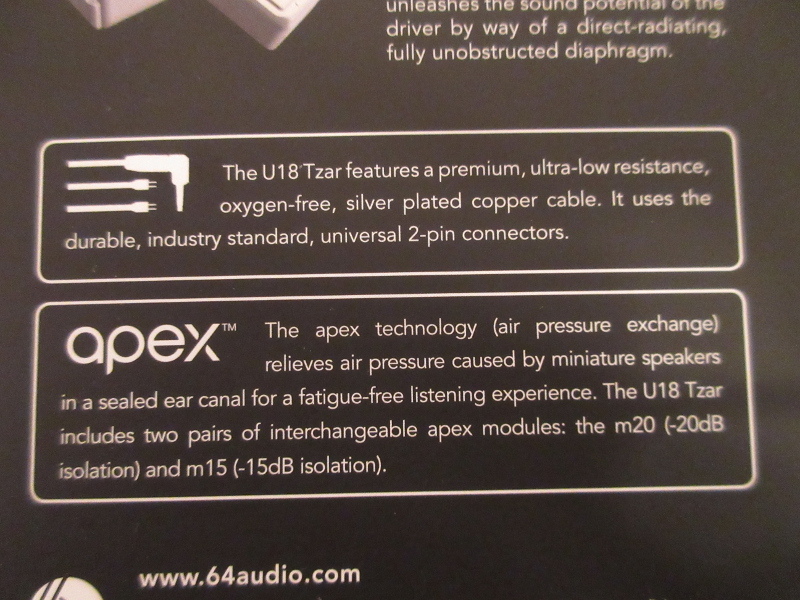 You will also find the info about their new cable and the description of APEX modules. This is a type of packaging you would expect to see on the shelves of traditional brick-and-mortar shops, reminiscent of the days when people used to go to the actual store to browse the isles, to read the packaging, to learn about the product before making a decision to purchase it. Obviously, you can't go to your local Best Buy to pick up a pair of 64audio IEMs, but I do appreciate the effort put into the packaging design and can see owners proudly showcasing it on their desk at home. 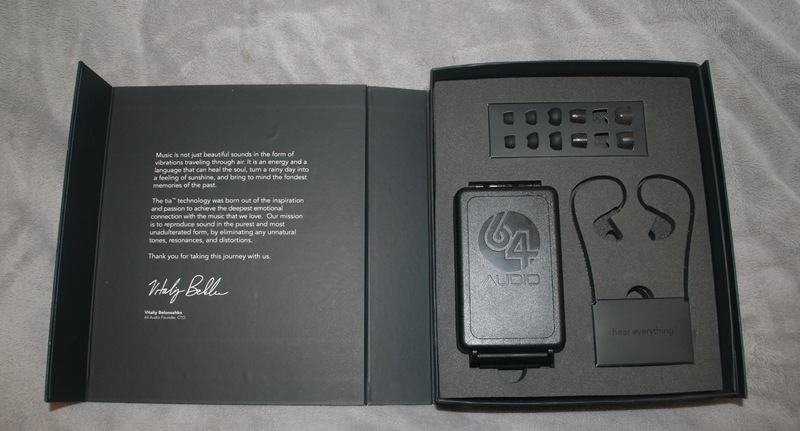 With a packaging sleeve off, you are looking at a black cardboard box with a magnetic latch front cover which has a glossy 64audio logo, also in black. After you flip the cover open, you can read a personal message from Vitaliy Belonozhko, founder and CTO of 64audio, with a Thank You note at the end of the message. 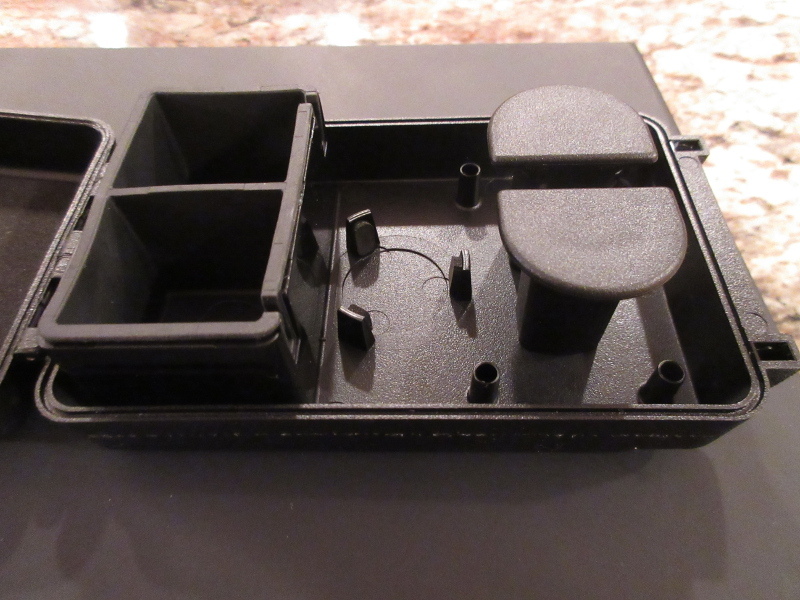 Inside of the box you have a foam cutout securely housing U18 shells with an attached cable, 64audio custom travel case inside of another secure cutout opening, and a small cardboard tray with 6 pairs of eartips. Overall, it was a satisfying unboxing experience, and it was interesting to read about the product without going on manufacturer webpage. Since this is a universal version of U18, it arrived with many eartips. 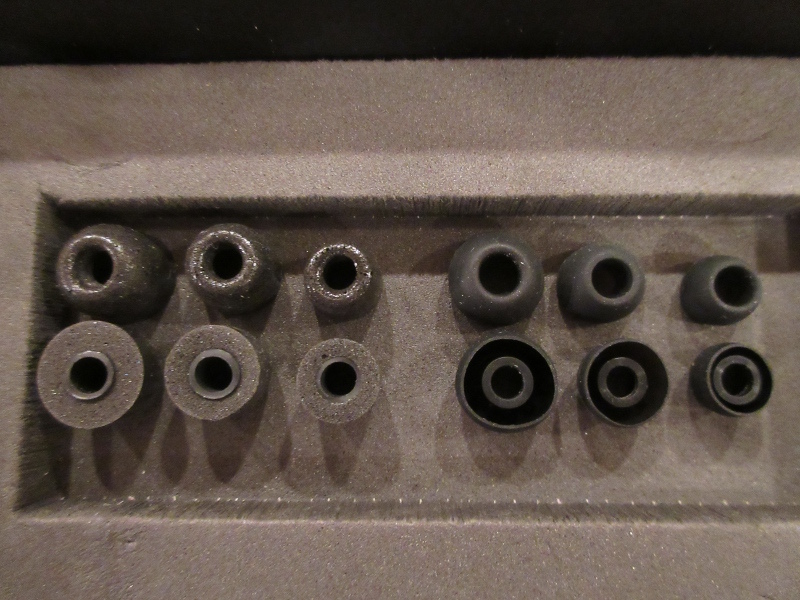 Here you will find two sets with 3 pairs (S/M/L) of foam eartips, and 3 pairs (S/M/L) of generic silicone eartips. Choosing the right eartip is a matter of a personal preference which going to affect not only the fit and the comfort, but also the sound. For me personally, I have dozens of other spare eartips and usually take my time to tip roll to find the right one with the best seal, making sure I get the full doze of the bass! I didn't find any of the included ones to work well with my ears, so I ended using a pair from my private stash. I do wish 64audio would include a better selection of eartips, maybe another set with hybrid tips that have a firmer cap and a longer stem. Other included accessories were a custom storage case which I'm going to talk about next, 64audio round sticker, and a product manual with some useful info about the fit, care & maintenance, handling detachable cable and apex modules, and volume advisory. Inside the storage case you will find a small dehumidifier, cleaning tool, shirt clip, and 2 sets of APEX modules (M15 and M20). Perhaps it would have been a cool idea to have a shirt clip that can also be used to grab and to remove Apex modules. 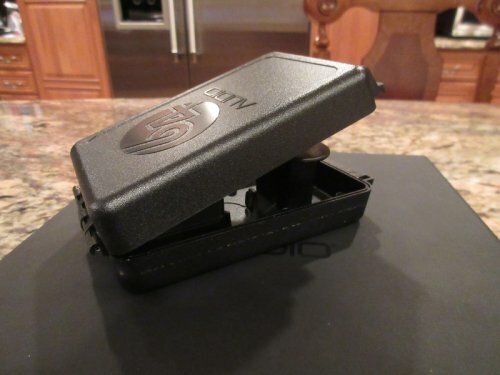 In my previous 64audio reviews, I call their new case a “VIP case”. Everything from an easy to handle wide latch to an air valve eliminating build-up of inner case pressure when you close it, individual earpiece storage sections with removable rubber lining to a custom built-in cable winder, a spot to plug right angled headphone connector and to place the included round dehumidifier container, as well as a built in organizer to hold securely a shirt clip (included), a cleaning tool (included), and 2 sets of APEX modules (M15 and M20 included) – all this was custom tailored and well thought of. There is even enough room if you decide to use a thicker replacement cable. When you placing the order, you can also specify if you want your name to be etched on the top of the storage box to personalize it. While many companies use off the shelf Pelican or Otterbox storage cases with a pre-cut foam inserts, 64audio went one step further with their own custom designed case which protects your investment and keeps everything organized inside. Many IEM manufacturers are starting to pay more attention to included cables, and lately I noticed quite a few releases with other than cheap OFC stock cables. Not everybody has a collection aftermarket cables, and some people don’t realize that a metal conductor can have an influence on the sound of IEM. Just like we go through eartip rolling (with universal IEMs) to finetune the sound, you can do the same with cables. Here 64audio did their own homework, testing various wires to settle on a new SPC (silver plated copper) cable they include standard with A/U18 and TIA Fourte. TIA drivers can give you super revealing details which can be missed with OFC cable or turn grainy with silver or other exotic wires. Also, considering all SPC cables are not the same, I found this new 64audio cable to have sound characteristic closer to pure copper cable. I will talk more about its sound property in the follow-up aftermarket cable shootout. As far as the cable goes, it feels very durable and yet flexible enough without springy memory effect. 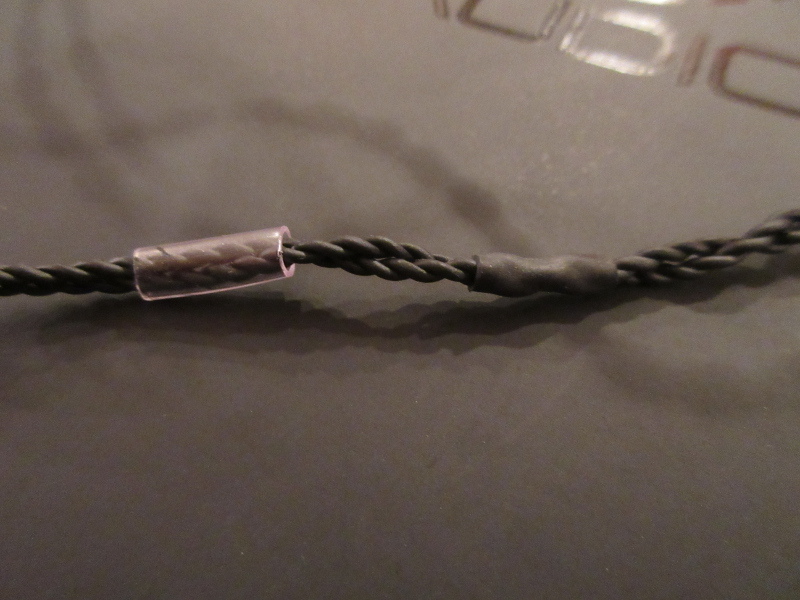 It has 4 separate conductors, all inner-twisted, with a tight rubbery black shielding, and no microphonics effect. The headphones plug is a premium gold plated 3.5mm TRS right-angled by Neutrik which has a built-in rubber-boot strain relief. This is a single ended TRS plug, but since you have 4 separate conductors, if you’re up to a challenge you can try to re-terminate it to a balanced connector. 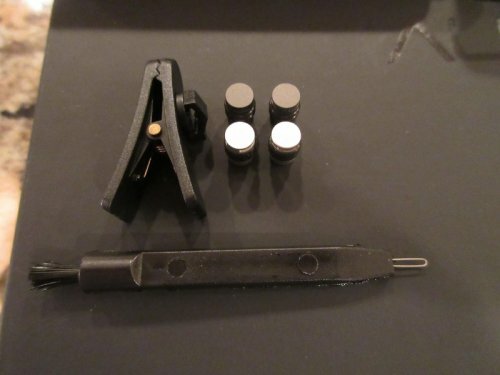 The y-splitter is a common heat-shrink tube, nothing fancy, and the chin-slider is a clear oval piece with enough friction to keep it from sliding freely. 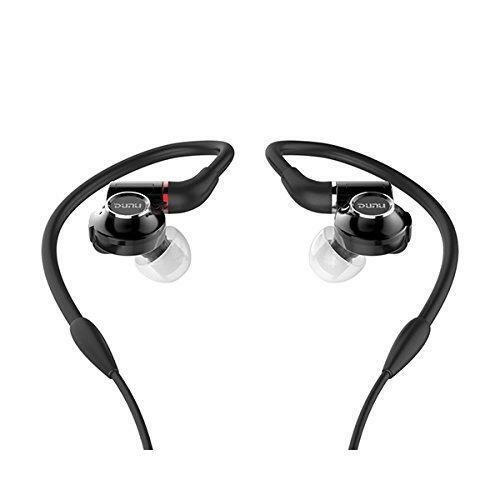 Toward the earpiece connectors, you have a memory wire which you pre-shape for comfort. I’m not a big fan of memory wires, but this one works fine and felt secure. The 2pin connector is universal which can be used in both surface and recessed 2pin shell sockets, and it’s conveniently color-coded with a Red dot for the Right side and a Blue dot for the Left side. 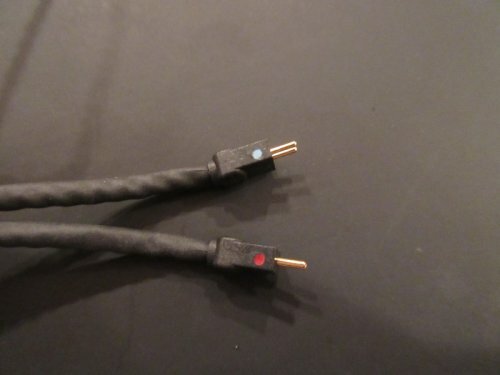 I'm a cable believer because I hear the difference, either a subtle or a more pronounced, and I have mentioned in many of my other reviews that intent of my testing with different cables is not to stir up a controversy, but rather to share my experience of what I hear. Feel free to skip this section if the talk about the cables offends you. In this test, I used U18 w/M20 module and compared various cables to 64audio stock SPC cable. I did volume match by ear because many of these multi-conductor thicker cables have lower impedance which usually result in a louder sound that could be misleading when analyzing and comparing to a stock cable. Many of these cables are from Music Sanctuary where you can also order both U18 and TIA Fourte. Last, but not least, I hear the changes but nothing is night'n'day. Cable doesn't operate like an EQ to drastically change the sound, but I hear a certain refinement of the sound which I describe below. PWA No5 - wide soundstage (a touch wider than Ares II and Zen), deep sub-bass extension, more rumble you can feel, stronger mid-bass slam, smoother, more organic upper mids and treble. EA Ares II - wide soundstage, nice sub-bass extension but less rumble than No5, a touch less mid-bass impact, smoother revealing upper mids (a little brighter than No5) and treble. HSA Zen - wide soundstage, deep sub-bass extension (as deep as No5) but with a little less rumble (than No5), stronger mid-bass slam (similar to No5), and smoother revealing upper mids and treble (similar to Ares II). 64audio SPC (stock cable) - sounds very similar to HSA Zen, just a bit narrower in soundstage depending on the source since stock cable is SE vs other cables being BAL (depends on a performance of the source and its difference between SE and BAL HO outputs). Even so this is silver-placed cable, I hear it perform more like a pure copper cable. While for my own personal taste I prefer a pure copper cable pair up with U18, I still decided to try these iems with other more exotic cables. 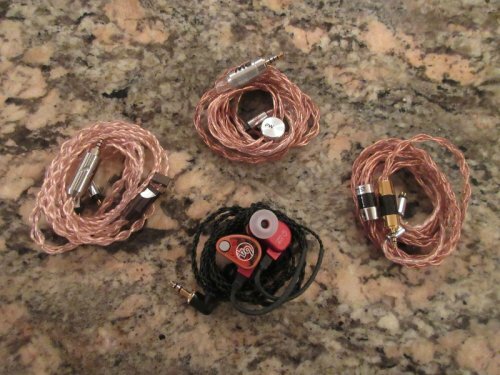 Keep in mind, the three after market pure copper cables (No5, Ares II, and Zen) cost under $150, while the cables below cost more due to a thicker multi-conductor wires and more expensive materials with pure silver, gold plated silver, or hybrid combinations of both. HSA Aurora - wide staging, deep sub-bass, punchy mid-bass, revealing upper mids, crisp treble. EA Thor II+ - wider staging, a little less rumble, though still deep sub-bass, punchy mid-bass, bright revealing upper mids, crisp treble (more on a brighter side). Whiplash TWau - wide staging, good sub-bass extension but less rumble, punchy mid-bass (a little less impact), revealing upper mids, crisp treble (more on a brighter side). PWA 1960 4wire - very wide soundstage (like No5), good sub-bass extension but less rumble, punchy mid-bass with less impact, revealing upper mids, crisp treble. Sound sig a little mid-forward with a bit of sibilance. ALO Ref8 - wide staging, good sub-bass extension but less rumble, punchy mid-bass with less impact, revealing upper mids, crisp treble. Sound sig is a bit mid-forward. Whiplash TWag v4 - wide staging, deep sub-bass rumble, strong mid-bass punch, smooth revealing upper mids, crisp treble though it's a little too bright. PlusSound Tri-metal - wide staging, good sub-bass extension and a nice rumble, punchy mid-bass, revealing upper mids (on a brighter side), crisp treble. Sound sig is more mid-forward with treble being a little too hot. I already mentioned U18 design spoilers in the Intro of my review, so now let's take a closer look. It all starts with a new anodized aluminum shell, very slick and durable, with rounded corners, and with a smooth slightly faded red finish and a copper faceplate with a patina inlay. 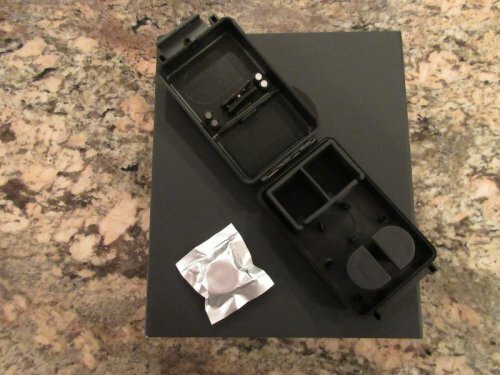 Each shell weights about 8g, including the removable Apex module, and has a comfortable and secure fit. The degree of sound isolation will depend on eartips and Apex module selection. Make sure you choose the correct eartip to give you the best earcanal seal, and then choose between M20 (-20dB isolation) or M15 (-15dB isolation) modules. Apex module, which stands for air-pressure-exchange, is exclusive to 64audio and intended to relieve air pressure in a sealed earcanal. 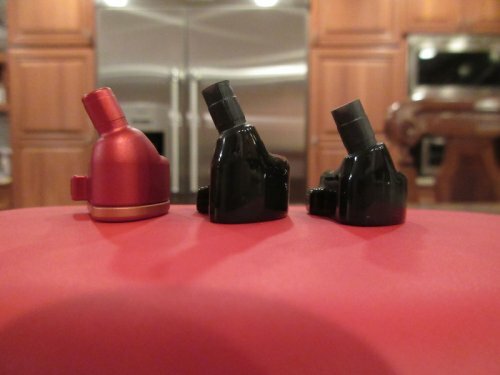 Many are probably familiar with Adel modules which I went over in my U6 and U12 reviews of the first gen 64audio shells; Adel modules are not forward compatible with the new gen shells designed for Apex modules. There has been a number of debates about benefits of one versus the other, and 64audio pointed out that Apex and Adel don't share the same design and use different materials inside. Personally, I don't experience hearing related problems which can benefit from using one vs the other, thus I can't weight in on this debate. But I do find the original Adel U6/U12 and the new Apex U12/U18 to have a similar fatigue-free extended listening experience with an open sound feeling and no ear pressure build up. Personally, I treat each module (in case of U18, I'm talking about M20 and M15) as a sound shaping tool which I'm going to go over in more details in my Sound Analysis section of the review. Regarding the design inside of the shell, we are not only talking about a very efficient stack up of 18 BA drivers, 4 way passive crossover, and Apex module, but also introduction of a new open BA driver (TIA). Balanced Armatures are typically self-enclosed with a single opening port, and usually they are grouped and tubed (in multi-BA IEMs) to be routed to a specific bore in the nozzle. Open BA driver has one of the enclosure walls removed, to enable direct-radiating of the inner diaphragm which no longer has a 4-wall confinement. U18 drivers are partitioned in groups of 8x Lows, 8x Mids, 1x High Mid, and 1x TIA driver. 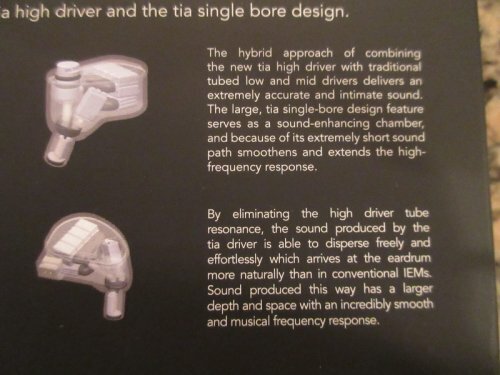 While other drivers are still tubed, the TIA driver is placed in a nozzle which becomes a sound-enhanced chamber going to a mesh covered single bore opening. So, instead of a typical multi-bore nozzle exit where each group of the drivers is brought out individually for the sound to be mixed in your ear canal, it looks like the sound here is being mixed and combined inside of the nozzle chamber. That also means that TIA high driver is closer to your earcanal/eardrum and shouldn't be affected by an artifact of resonance associated with tubed sound routing which apparently affects more high drivers. Also, Apex module provides an air pressure relief pass from the earcanal and through to the pinhole vents located inside of the ridges under the module's cap. M15, which has less isolation, features 2 symmetrically positioned vents, while M20 features only 1 vent. To be honest, I usually treat most of the IEMs like a black box and make my final judgment based on the sound quality. But you can't deny that U18 design is a big step up from 64audio previous U12 flagship. And the fact that now you have a machined aluminum shell with 18 drivers and even a bit smaller footprint than U12 is quite impressive. 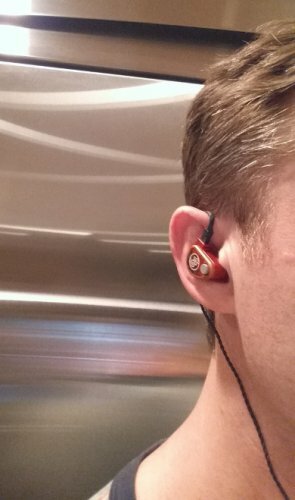 My ears are not "designed" well for CIEMs, thus I have to rely on universal IEMs where I found U18 fit to be very comfortable and secure. But I know that many people prefer Custom IEM design, tailored to their ears from audiologist impressions. 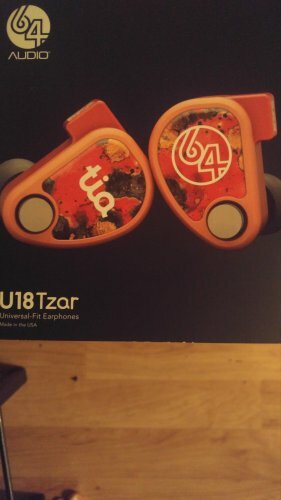 Prior to my U6 and U12 review, I had an opportunity to test A12 where I went through getting ear impressions and using 64audio on-line Designer to build CIEM. The Designer is web based with an advance set of visual tools where you pick the Model, then Choose Left/Right shell Colors (over 25 standard faceplate colors, 11 glitter faceplates, and even 4 glow color faceplate, in addition to 9 premium material and 6 wood finish faceplates), Custom or Standard logo selection, Cable length and color selection, and the option to put your name on the storage case to personalize it. Once the order is placed, you get a link to track step-by-step progress of your CIEM manufacturing. When analyzing U18 sound, you have to look at a separate pair up with M20 and M15 modules, like a switch between two distinct sound signatures. Prior to starting my critical listening, I did put U18 through 100hrs of standalone burn in, but that was more for a benefit of the cable as well as making sure that all the solder joints, internal wiring, and crossover components have reached their prime condition. Either if you believe or don't in a burn-in, for me it's almost like an OCD routine I go with every piece of audio gear. 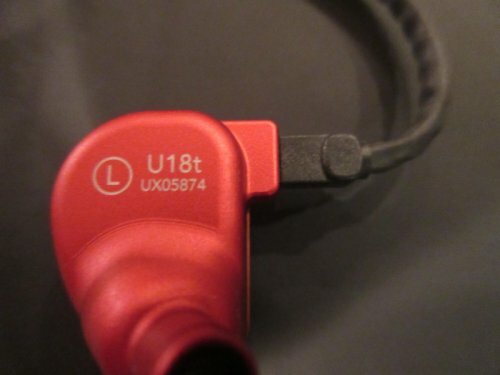 The first thing I noticed with U18, regardless of the module, is a very open and expanded sound like you would hear from a full size open back headphones. Also, while listening to U18 for extended period of time, I've never experienced an ear fatigue or a pressure associated with some other sealed iems, and that experience was very similar to my previous testing of U6 and U12 with various APEX and ADEL modules. Furthermore, I was very impressed with the coherency of driver tuning where all 18 BAs work together in a perfect unison. When it comes to the actual sound with M20 module, you get a full body balanced signature with a natural transparent tonality. Regardless of the type of instruments, real or synthesized, the timbre accuracy was convincing to my ears, and the same goes for vocals, either male or female, sounding natural and realistic. The sound has excellent retrieval of details, not on an analytical level but in its own natural way with a high level of clarity surrounded by smoother edges. U18 is quite forgiving when it comes to a poorly recorded music, and also works great paired up with various high res, mid-fi, and even some low-res sources. Starting with a low end, you get a deep textured rumble which you can actually feel since it's not just an extension but actually has a tasteful boost in quantity. Mid-bass has a speed typical of BA drivers, with a faster attack, but the decay is a little longer, giving the bass a bit of a dynamic driver characteristic with some additional body. Overall, bass is very well controlled, articulate, layered, well rounded, and with no spillage into lower mids. Lower mids are neutral, maybe a little toward the leaner side, and yet they surprisingly add some body to the sound. Upper mids are very clear and detailed while still retaining their natural smoothness. Interestingly enough, I don't hear as much of air between the layers of the sound when it comes to M20 module, but the perception of the sound is still layered, transparent, and very resolving. Treble is crisp, very well defined, with a nice extension, and well controlled airiness. When you replace M20 with M15, it feels like a switch to a different signature with a more revealing crisp airy sound that has a slightly more mid-forward characteristics, edging a bit more toward analytical level. This sound is a little more critical, not as forgiving with a poorly recorded music, especially if there are some spikes around 5k-6k area in the recorded material. With M15, bass becomes more neutral in quantity, with a less pronounced sub-bass rumble which you can still hear very well, but the quantity is reduced. The same with a mid-bass being not as intense, definitely with a little less impact. The overall bass is still very articulate, layered, well controlled. Going up to lower mids, they sound a little leaner in comparison to M20, though the sound never feels like being v-shaped. With a lower quantity of the low end, the upper mids perception becomes a little more forward, brighter, leaning more toward the analytical side and will a little more airiness between the layers of the sound. Treble is still crisp and clear, but has a little more crunch and more airiness which can push some poorly recorded tracks toward a little harsher tonality. The sound becomes more revealing, less forgiving. Regardless of M15 or M20 module, as I already mentioned, the sound is very open and has a natural expansion of the soundstage in all 3 dimensions. I do hear a very wide staging, but it's still realistic, not exaggerated. The depth of the sound is not too far out of your head and not too close in (not too intimate), feels like you are 3-4 rows in front of the stage. The separation and layering of the sound is excellent, regardless of the modules. As a matter of fact, even with M20 where you have more bass impact and slightly less airiness between the layers - layering and separation of instruments and vocals is still great, there is never a feeling of a sound being congested. The same with imaging having a very convincing positioning of instruments and vocals, a rather accurate positioning where you can easily pin-point every sound. M20 (aluminum finish) - more bass impact, more body in lower mids and overall sound, more organic natural presentation of upper mids and vocals, and a little smoother treble while still retaining the same level of airiness and resolution. M15 (gunmetal finish) - more neutral bass, less sub-bass rumble, more neutral leaner lower mids, brighter, a bit colder, and more revealing upper mids, and crisper treble. At the end of the day these modules are just another set of tools to fine tune the sound of 64audio IEMs. If I want more bass and smoother sound in U18, I switch to M20, if I want more neutral bass and more revealing upper frequencies I switch to M15. It will also depend on the pair up and the signature of the source. I'm not sure if it would be right to say that one module is better than the other, they just do a different job where everything is up to a personal preference. In my pair up test with different sources, I decided to be consistent and use U18 with M20 module along with an included 3.5mm SE stock cable. While U18 has an average 115dB sensitivity, I wasn't sure what to expect due to its 9 ohm impedance and how it will affect the hissing with different sources. Lotoo PAW Gold - very spacious soundstage, deep textured sub-bass rumble, punchy fast mid-bass, well controlled articulate bass, neutral lower mids (a touch on a leaner side), very detailed, revealing, layered, transparent upper mids, crisp well defined airy treble. No hissing. FiiO X5iii - spacious soundstage, textured sub-bass rumble with a little less quantity, punchy mid-bass with a little slower speed, bass is articulate but a little slower, a little more body in lower mids, clear, detailed upper mids, crisp well defined airy treble. Very slight hissing. 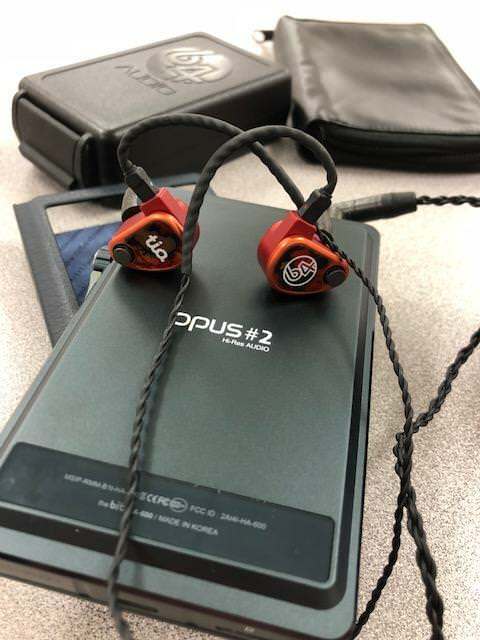 theBit Opus#2 - very spacious soundstage, deep textured sub-bass rumble, punchy fast mid-bass, well controlled articulate bass, neutral lower mids, detailed, revealing, layered, transparent upper mids, crisp well defined airy treble. No hissing. theBit Opus#3 - very spacious soundstage, deep textured sub-bass rumble, punchy mid-bass with a moderate speed, well controlled articulate bass, neutral lower mids, detailed, revealing, smoother upper mids, crisp well defined airy treble. No hissing. Cayin i5 - very spacious soundstage, deep textured sub-bass rumble, punchy fast mid-bass with a healthy doze of impact, well controlled articulate bass, neutral lower mids, detailed, revealing, smoother upper mids, crisp well defined airy treble. No hissing. iBasso DX200 w/AMP2 - very spacious soundstage, deep textured sub-bass rumble, punchy fast mid-bass with a nice impact, well controlled articulate layered bass, neutral lower mids (a touch on a leaner side), very detailed, revealing, layered, transparent upper mids, crisp well defined airy treble. No hissing. FiiO X7 w/AM3 - very spacious soundstage, deep textured sub-bass rumble, punchy fast mid-bass with a nice impact, well controlled articulate layered bass, neutral lower mids (a touch on a leaner side), very detailed, revealing, layered transparent upper mids, crisp well defined airy treble. No hissing. Cowon Plenue 2 - very spacious soundstage, deep textured sub-bass rumble, punchy fast mid-bass, well controlled articulate layered bass, neutral lower mids (a touch on a leaner side), very detailed, revealing layered transparent upper mids, crisp well defined airy treble (a little extra sparkle). No hissing. A&K AK120ii - spacious soundstage, deep textured sub-bass rumble, punchy fast mid-bass, well controlled articulate bass, neutral lower mids, very detailed, transparent upper mids (a little brighter upfront presentation), crisp airy well defined treble. No hissing. iFi Micro iDSD - very spacious soundstage, deep textured sub-bass rumble, punchy fast mid-bass, well controlled articulate layered bass, neutral lower mids, detailed, revealing layered, transparent upper mids, crisp well defined airy treble. No hissing. Samsung Note 4 - spacious soundstage, nicely textured sub-bass rumble, punchy mid-bass, well controlled articulate bass, neutral lower mids (a bit on a leaner side), detailed, revealing upper mids, crisp well defined treble. No hissing. Of course, the sound with my aging smartphone is not as resolving as with some of the DAPs, but it was still a great pair up. Using both LPG and Plenue 2 as my sources, I kept U18 with a stock SPC cable and M20 module, and volume matched every pair by ear. Also, I noted which cable was used with other C/IEMs in comparison to U18, and if necessary used EA 2.5mm-to-3.5mm adapter. U18 vs ES80 (Ref8) - soundstage: 18 has more width while 80 has more depth; 18 has deeper sub-bass with more rumble and faster mid-bass with more impact. 80 bass is more neutral, and sub-bass extension is not as deep. 18 lower mids are a little leaner while 80 is a little more neutral with more body. 18 upper mids are more revealing, more resolving, while 80 is smoother and a little warmer. 18 treble has more sparkle and more airiness. Overall, 80 is more neutral while 18 is more balanced and also more resolving, more layered, and more transparent in comparison. U18 vs ES60 (TWag v3) - soundstage: the depth is very similar, but 18 has more width; 18 has a deeper and more textured sub-bass with more mid-bass impact. 60 sub-bass is lower in quantity, and mid-bass is not as articulate, overall ES60 bass is not as tight. 18 lower mids are a little leaner while 60 is more neutral with more body. Both have a revealing upper mids, but 18 is more layered and with better retrieval of details, while 60 is a little smoother. Both have a sparkly airy treble, but 18 has a little more airiness and better extension. U18 vs W80 (Ref8) - soundstage: 18 has more width and depth; both have a very good sub-bass extension, but 18 has more rumble and more texture, both also have a nice mid-bass impact, but 18 is tighter and more articulate. 80 lower mids are more neutral and with more body while 18 is leaner. 80 upper mids are smoother, warmer, more organic while 18 upper mids are more layered, more revealing, with better retrieval of details. Both have a good treble extension but 18 has more sparkle and airiness. U18 vs Zeus XRA (Ares II) - soundstage: both have a similar depth but 18 has a touch more width; while XRA sub-bass has a good extension, its very neutral and sounds flat in comparison to a lot more rumble and texture in 18 sub-bass, both have a fast mid-bass with 18 having more impact; while both have a well controlled and articulate quality bass, the bass quantity (especially lack of sub-bass rumble/texture in XRA) is the biggest thing that sets them apart. Both have lean lower mids, though 18 has a touch more body, and both have a layered revealing upper mids while 18 has a touch smoother tonality while XRA has a little more air between the layers of the sound. Both have a good sparkly treble extension with lots of airiness, though XRA treble can get a little more piercing. Also, with Zeus XRA you hear a higher level of hissing with LPG/P2, while 18 was down to a minimum. U18 vs W900 (1960 4w) - soundstage: a very similar soundstage width (here, W900 greatly benefits from 1960) while W900 has a little more depth, projecting slightly more out of your head; both have a great sub-bass extension, but I hear 18 going a touch deeper, having a little more rumble, and having more articulate texture. Both have a strong mid-bass impact, but 18 is a little faster. 18 lower mids are a little leaner while W900 is closer to neutral with a little more body; upper mids are revealing in both but W900 is smoother and not as layered, while 18 upper mids are little brighter, with better layering and separation. Both have a very similar treble in terms of sparkle, extension, and airiness. While with Zeus it was a quantity of bass, here it's the quality of bass that makes the biggest difference where you hear a more typical DD performance when listening to W900 vs a faster, tighter, more articulate performance of BA drivers in 18. U18 vs K10UA (stock SPC) - soundstage: similar depth while 18 staging is wider; both have a good sub-bass extension, while 18 goes a little deeper, has more textured rumble, a little higher quantity; when it comes to mid-bass, both have a fast articulate mid-bass punch, though 18 has a touch more quantity. Lower mids are lean in both iems, while upper mids have a similar revealing layered sound, though I hear 18 having a little more air between the layers. Both have a crisp airy treble, but K10 treble is a little more piercing. U18 vs S-EM9 (Thor II+) - soundstage: while 18 has more width, EM9 has more depth; both have a similar textured sub-bass rumble, even the quantity coming closer, but mid-bass varies in here with 18 being tighter and more articulate while EM9 being slower and a little hollow in tonality, when compared. Lower mids are leaner in 18, while EM9 is more neutral with a little more body. Upper mids are more revealing and layered in 18 while EM9 is more forward, smoother and more organic in tonality, not as layered as 18. Both have a well defined crisp treble, though 18 treble has a better extension. U18 vs Maestro (TWau) - soundstage: both have a similar depth while 18 has more width; both have a great sub-bass extension though 18 has higher quantity rumble, both have a fast mid-bass punch, but U18 bass feels tighter and a little more articulate in comparison. Maestro lower mids are more neutral with slightly more body in comparison to leaner 18 lower mids. Both have a revealing upper mids, Maestro is a little smoother while 18 is more layered with a better definition. Both have a nice crisp treble with a similar extension, except 18 treble has a better definition. U18 vs VEGA (ALO Litz SPC) - soundstage: 18 has a touch more width while VEGA has more depth; VEGA has noticeable more sub-bass, but it's not as textured as 18. Also, U18 mid-bass is faster, tighter, more controlled and with a better articulation; in comparison, VEGA mid-bass has more slam. 18 lower mids are leaner, while VEGA is a little north of neutral with more organic body. Upper mids are more layered and more revealing in 18 while VEGA is a little smoother and a touch warmer. Both have a crisp airy treble, though VEGA is a little more piercing. U18 vs Xelento (stock SPC) - soundstage: similar depth but 18 has more width; both have a deep texture sub-bass rumble that goes pretty deep, but Xelento has more sub-bass quantity. Mids bass in Xelento is slower but has more impact than U18 mid-bass, but in comparison U18 mid-bass is faster, tighter, with more control. Lower mids are more neutral and with more body in Xelento, upper mids in 18 are more revealing, better layered, a little more resolving, while Xelento is also revealing but smoother in comparison. Treble is very similar with a crisp airy well defined performance. U18 vs UERR (stock OFC) - soundstage: similar staging depth while 18 is wider; U18 sub-bass extends lower and has more rumble in comparison to a more neutral flat sub-bass in UERR. Mid-bass in 18 also has more impact and tighter in comparison to a more neutral and a little slower UERR mid-bass. The overeall bass in UERR is more neutral and slightly more laid back. 18 lower mids are leaner while UERR is smoother and with a little more body. Upper mids are clear, detailed, and smooth in UERR while 18 upper mids are more revealing, layered, transparent. Both have a crisp well defined treble but 18 has a better extension and more airiness in comparison. U18 vs ERIB1C (stock OFC) - soundstage: a similar staging width while ERIB staging is deeper; while ERIB sub-bass does have a good extension and a little bit of rumble, it's very neutral and flat, definitely not a fair comparison to a more textured U18 sub-bass with a lot more impact and more textured rumble. The same with mid-bass, while both share a similar speed of the bass, ERIB is rather neutral in comparison to more articulate impact of 18. Both have a very similar lean lower mids, and revealing layered upper mids, though 18 maybe a touch smoother. Treble is where I hear more difference with ERIB having more crunch and airiness. U18 vs U12 w/M15 (Ref8) - soundstage: both have a similar depth but 18 is wider; U18 sub-bass goes a little deeper and has more controlled rumble and more quantity, mid-bass is faster, tighter, and more articulate in 18 while 12 is a little slower, and not as controlled, spilling a bit into lower mids. Lower mids in 18 are lean while 12 are a little north of neutral, with more body. Upper mids are more revealing, more detailed, more layered in 18 while 12 is smoother, warmer, more laid back. Treble has more sparkle, more airiness and better extension in 18. 64audio family: U6, U12, U18. 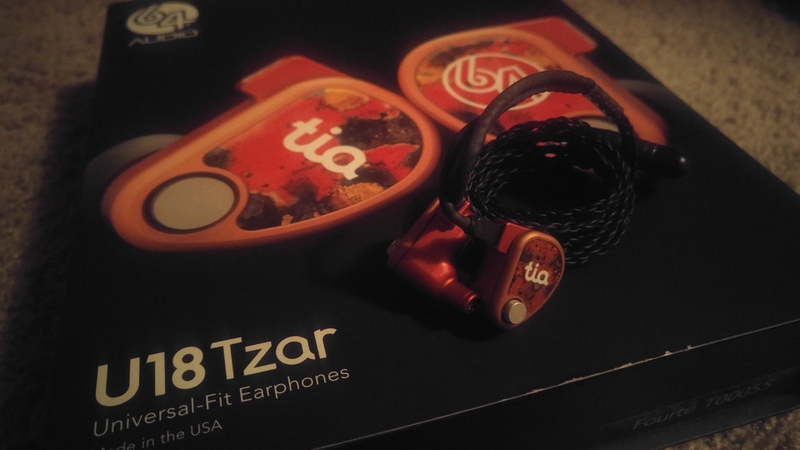 64audio U18tzar is one of the most expensive IEMs I had a chance to review, and it’s also one of the closest to hit a sweet spot of my sound preference when paired up with M20 module. That’s why in the last few months it became my go-to IEM. Does this mean it will be everyone’s cup of tea with everybody else feeling the same about it? It’s hard to tell because we all have a different sound preference, use different sources, listen to different genres of music, and have a different ear anatomy. Look at the other flagships mentioned in a Comparison section of my review, I'm sure there are people who have these at the top of their list. Btw, some of these IEMs along with premium aftermarket cables could cost even more than a stock U18. But either way, sometimes it makes sense to invest into one TOTL flagship that hits a sweet spot, rather than buying a handful of flagships that dance around it. At the end of the day it all comes down to a personal preference when trying to figure out your ideal IEM. I found U18 to have a very detailed, resolving, balanced sound with a soundstage of an open back headphones. When equipped with M20 module, I hear a full body natural revealing tonality with a very impressive quality/quantity bass, and when switching to M15, I hear a more neutral, brighter, and even more revealing airy sound. It felt like flipping a switch when replacing the modules, and I was able to fine-tune the sound further by cable rolling. 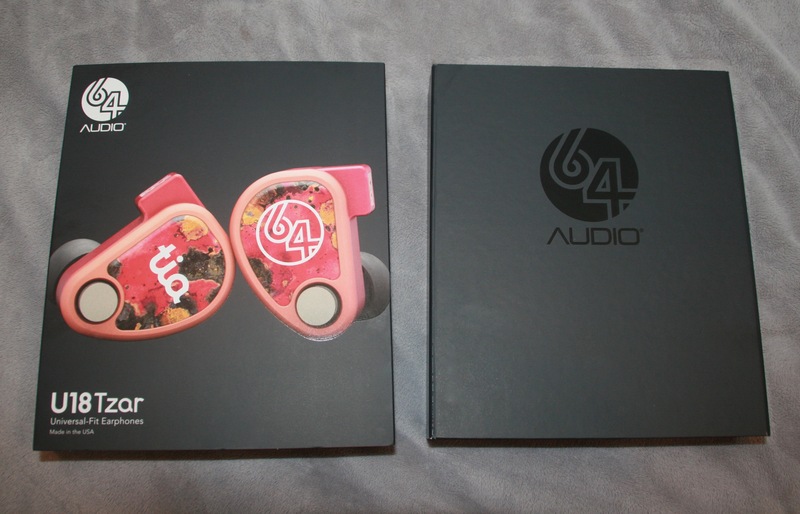 I know many are also interested in 64audio other flagship, TIA Fourte, and maybe I will get an opportunity to review and to compare it later. But for now, I'm holding U18 in a very high regard. Also, if you get a chance to attend your local CanJam audio show where 64audio is often one of the exhibitors – take the opportunity to hear 64audio IEMs and other manufacturers flagships to compare and to decide which one is the best for you. Reading different reviews and impressions is important to get others perspective about the product, but nothing can substitute your own personal experience when deciding to invest into TOTL flagship IEM. junix, hqssui, ngoshawk and 4 others like this. My preferred sound signature: A bit bass heavy, forward mids, and neutral treble. Love high detailed and clear sound. 64 Audio is a great family run company with a rich history. 64 Audio is unsurprisingly named after the year 1964, “a pinnacle year for Rock music”, after which “music going forward would never be the same”. 64 Audio writes that “everything about that special year (1964) was life changing, and it left an indelible mark on everyone who lived it or later learned of it. 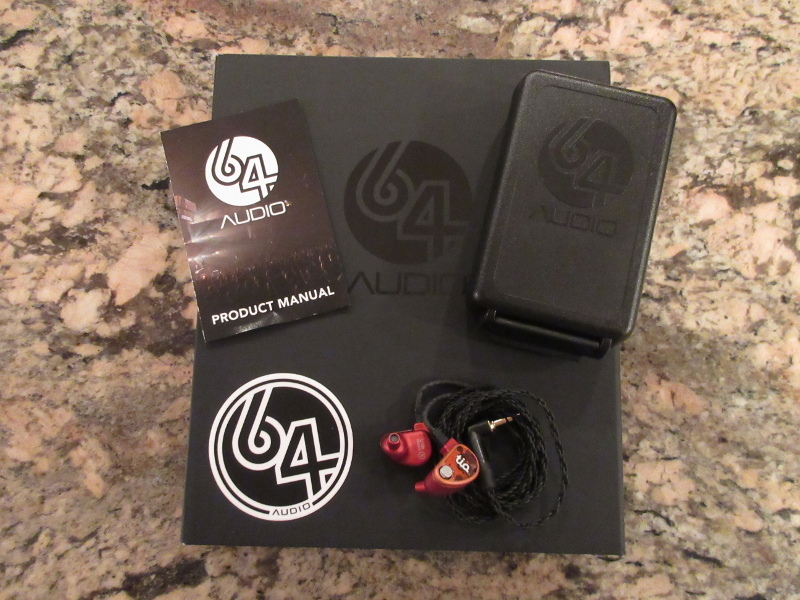 64 Audio’s sole focus is making that same mark when it comes to personal audio”. And after hearing the U18 and the Fourté, I think 64 is on track and accomplishing their “sole focus”. I personally think 64 Audio is somewhat overlooked in the audiophile world today, and I do believe they deserve much more attention. While I was not head over-heels crazy for their current U-Series (which is supposedly going to get a “makeover” soon), the U18 and the Fourté blew me away at CanJam SoCal. So much so that I quickly got myself one of each to review. My Fourté review can be found here: (link will be added when Fourté review goes live). 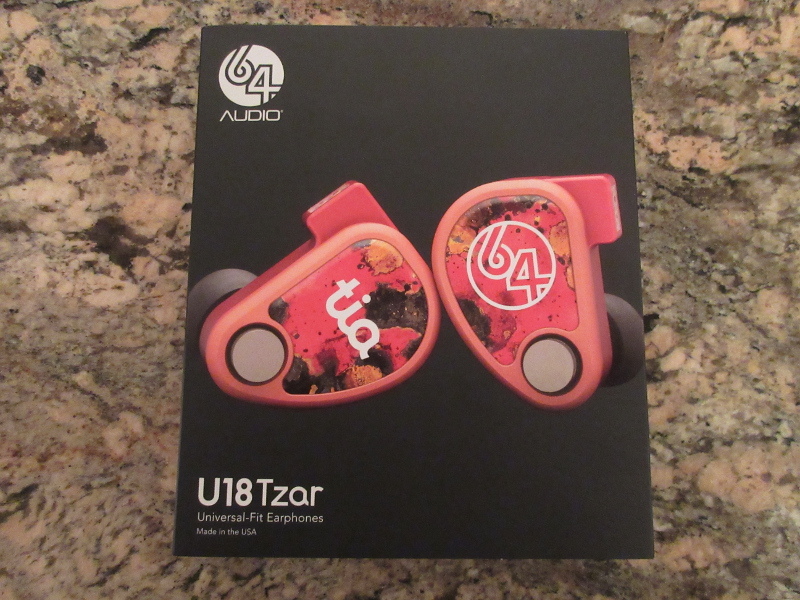 This is my review of the 64 Audio U18 Tzar. This unit was not provided to me for free, and I had purchased the unit. In every review I write, I put forth my completely honest and non-biased opinion. If I do not like something, I will say so in plain english. That being said, I would like to thank Lisa, Bogdan, Chris, Roman, and Vlad at 64 Audio for putting up with my incessant questions/nagging, and for helping me afford this unit. The U18 Tzar is the world’s first 18 driver IEM. Yes, you read that correctly, 18 drivers per side, which means 36 drivers total. While more drivers does not always equate to a better IEM, it is unquestionable that you can hear the difference between any other multi-driver IEM and the U18 Tzar in terms of detail (which I will elaborate upon later). The U18t has 8 low BAs, 8 mid BAs, 1 mid-high BA, and 1 tia high driver. For those of you not familiar with the tia driver, it is a patented tubeless driver from 64 Audio. 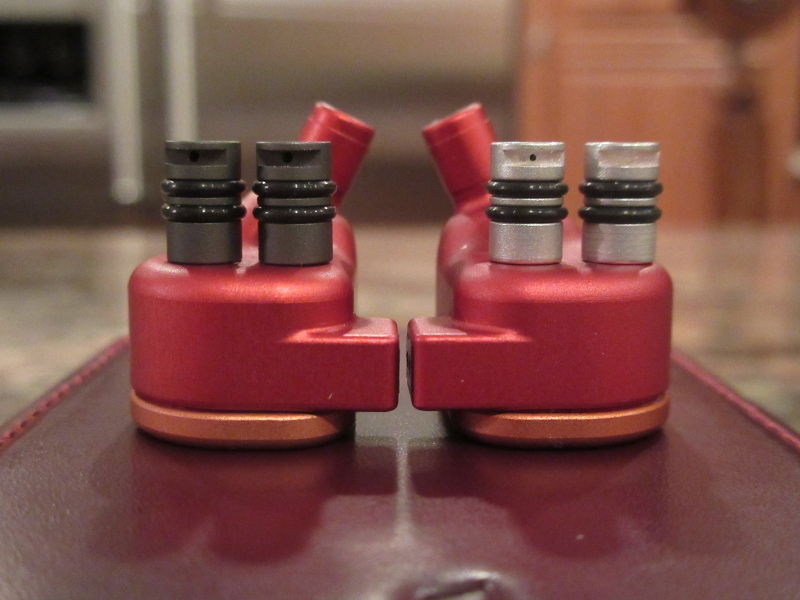 Essentially, the tia driver on the U18 pumps sound into a chamber located in the nozzle of the IEM, which is then released along with the rest of the sound, into your ear. The best example I can give is that your living room is the shell of the IEM, and the tia drivers are like the specifically placed speakers in the living room. 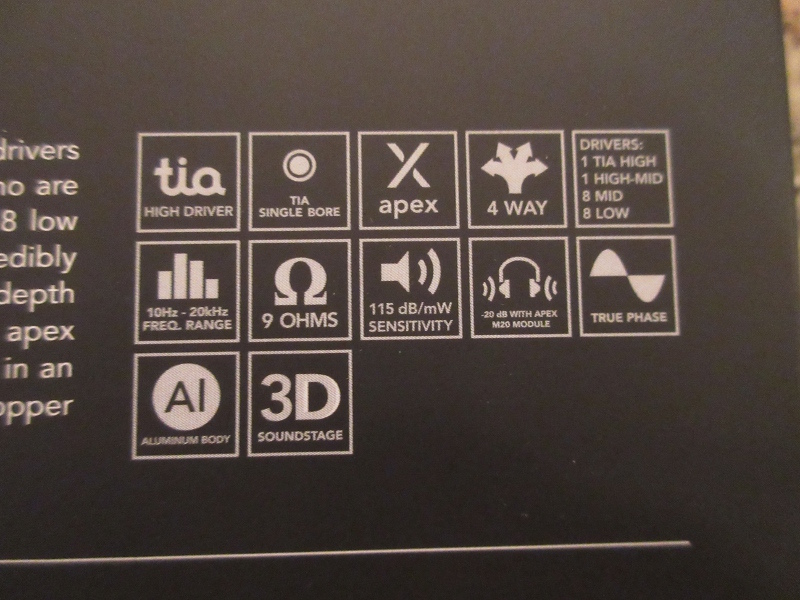 The tia driver produces incredibly smooth, open, extended, and airy highs. 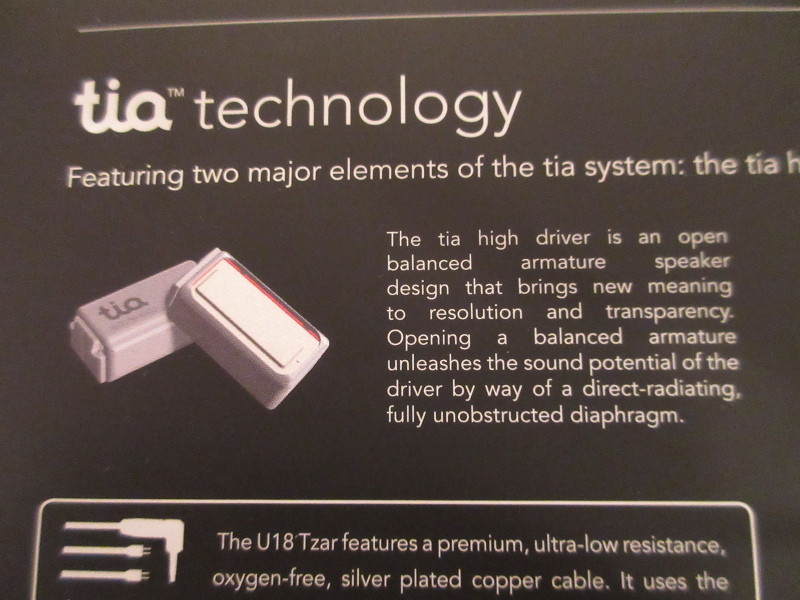 It is almost impossible to put into words the difference between the sound of a tia driver and a regular BA driver, but there is zero question in my mind that the tia driver will play a major role in the future of the IEM industry. The U18’s housing is made of aluminum and the faceplate is made of acid-burned copper. While there are varying opinions of the look of the U18, I find it is pretty gorgeous. But looks of course do not affect the sound of the IEM. Packaging is big. With minimal accessories, 64 does not give you too much. The accessories provided are just enough. 3 sets of Isolation Comply Memory Foam Tips of different sizes are included along with 3 more sets of different sized silicon tips. 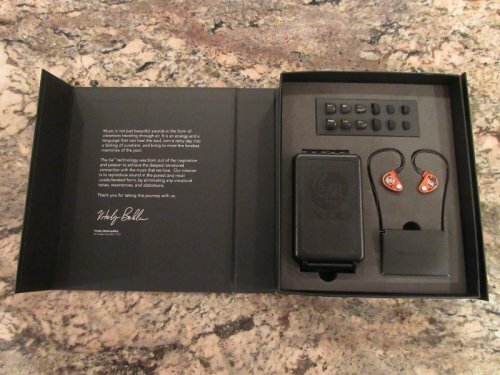 A product manual and a warranty card are included along with the headphones of course. The best part of the accessories is the 64 Audio case. It is small enough to fit in your pocket, and is amazingly designed. 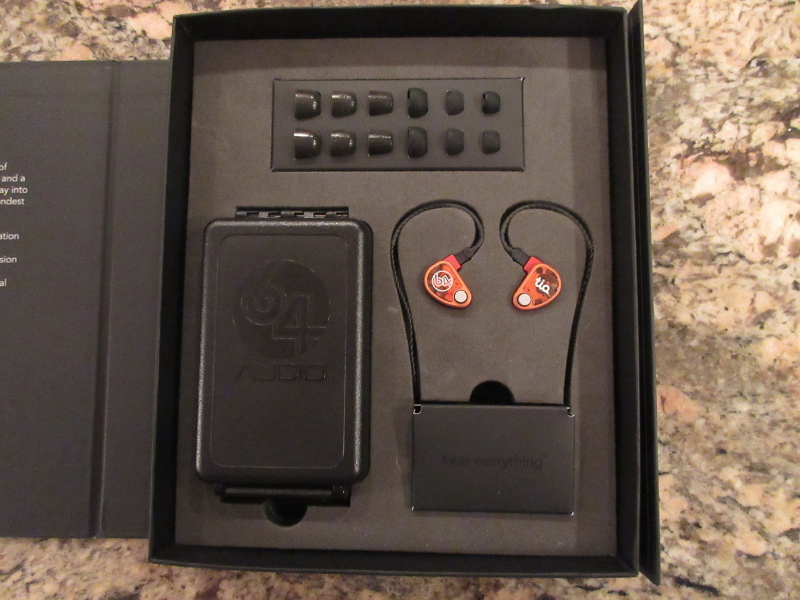 With a cable wrap, and specific little cubbies to but the IEMs themselves, the case is sure to protect your investment. 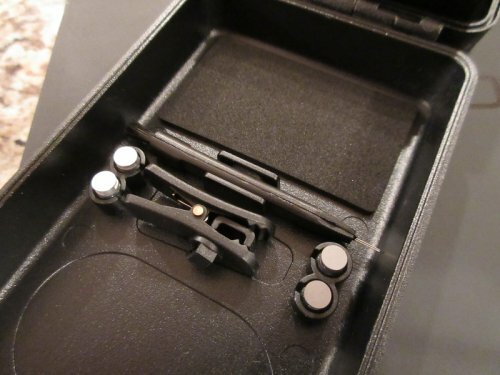 Equipped with a small packet of silica gel in the case, your IEMs will not be damaged by moisture. 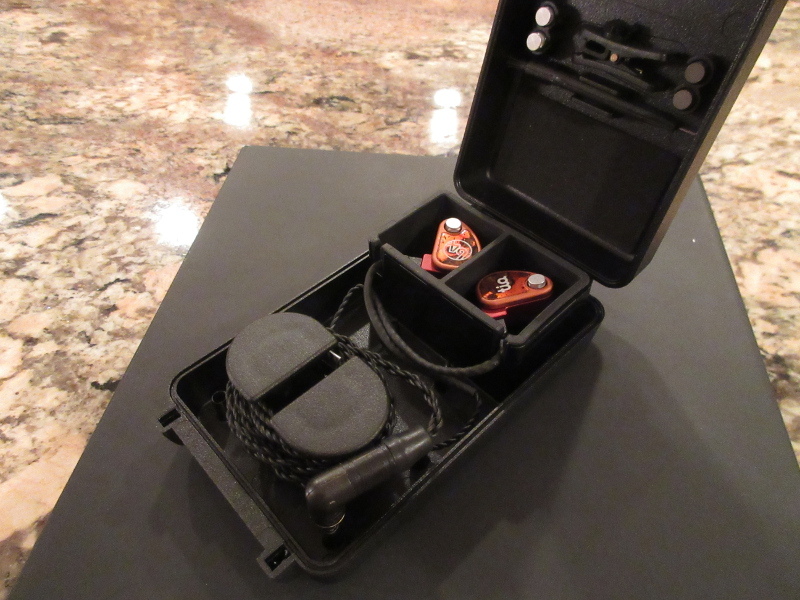 The case also holds a classic cleaning tool, a shirt clip, and a storage spot for 2 sets of Apex modules. The U18 also comes with both sets of Apex modules: the M15 and M20. Wow. Just wow. The entire frequency range sounds realistic. The sound quality of these IEMs are so good that I actually really do feel as if I am at a personal concert, with the artist singing directly to me. The entire signature is pretty flat, with no one frequency range really being emphasized. Bass: Bass on these IEMs is incredible. Which is good, because with 8 BA’s pumping out the bass, you would expect nothing less. Bass is super textured and detailed all throughout the bass range. There is a fantastically textured sub-bass rumble, coupled with the well textured mid and upper bass range. As I listen to these IEMs, I hear new details in the bass lines of my music that are not clearly audible on other TOTL IEMs. Because the bass is so clean, textured and detailed throughout the entire frequency range, male vocals and lower background vocal harmonies are incredible. The kick drum thump is actually textured and distinguishable in music, which is super incredible. Bass on these IEMs is neutral, and, for my taste, I am left wanting a bit more. However, after a “brain burn-in”, the bass is at the perfect level. When needed, the bass is present and clear and textured, but it does not overshadow the highs or mids. Mids: Vocals are a clear focal point on the U18. Both male and female vocals are very clear, textured, and scarily realistic. I feel as if I am being serenaded by Sinatra, and receiving my own personal concert from Michael Bublé. The emphasis on vocals is due to the lower and middle-mids being forward, but much like with the bass, lower and middle-mids do not overpower the rest of the mids or highs. The best example of how clean and textured the mids are on the U18 are the horn lines. Trumpet is so realistic, with a ton of texture. I feel as if I am in a room surrounded by horns. Because of this level of texture and realism, upper female vocals are also super realistic. 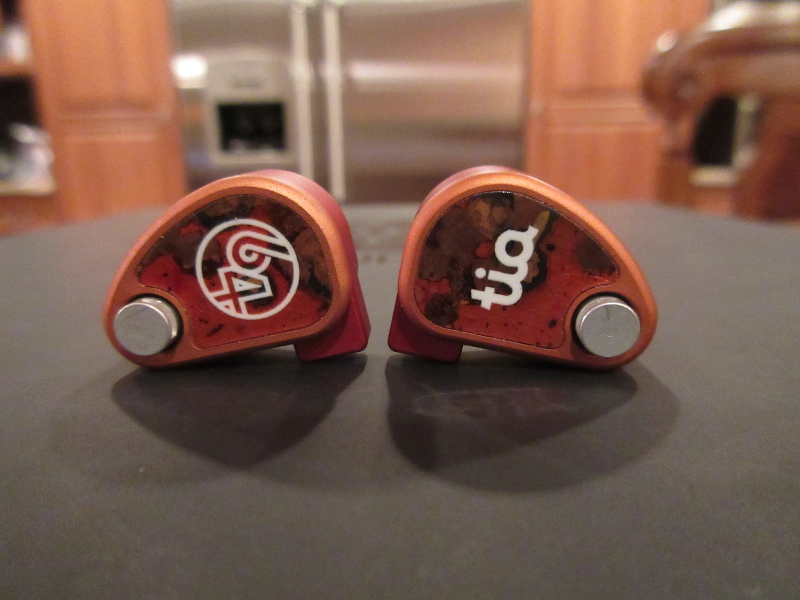 Treble: Tia is the future of IEMs. There is zero question in my mind of this fact. In an 18 driver IEM with only 1 high driver, one might expect the highs to be recessed, muddy, and to lack detail. This could not be farther from the truth. Highs on this IEM are most detailed, textured, and realistic sounding I have ever heard. 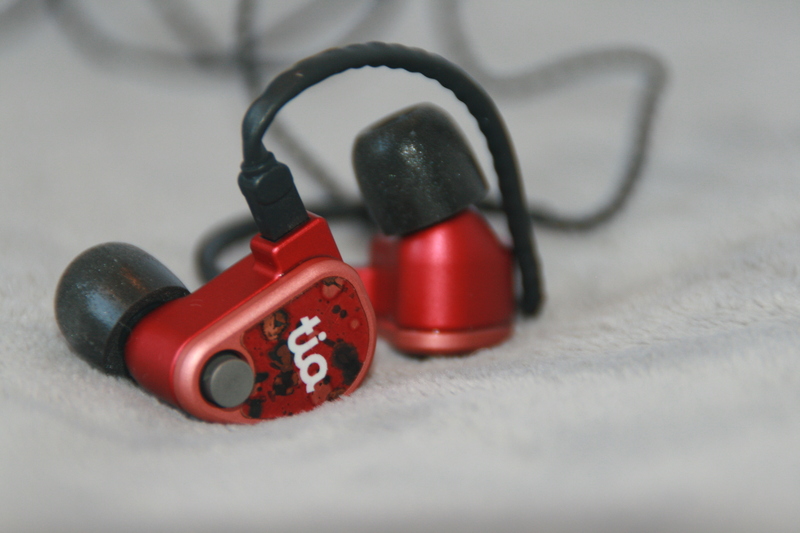 The tia driver sits in the nozzle, meaning it delivers highs directly into your ear. This is part of the reason why the highs are not overshadowed, but in fact, somehow perfectly balanced in the signature (when using Comply tips to which the U18 was tuned). One can rarely talk about truly textured highs, but in the U18, no one can deny the level of texture of the highs. The crash and sizzle of the cymbals is clear and textured. You can hear the vibrato of the sizzle of the cymbals, something I have never heard this clearly on any other IEM. Shakers are easily distinguishable and the snare is gorgeous. You can hear the vibrato and the different frequencies of the triangle. Of course there is zero sibilance. 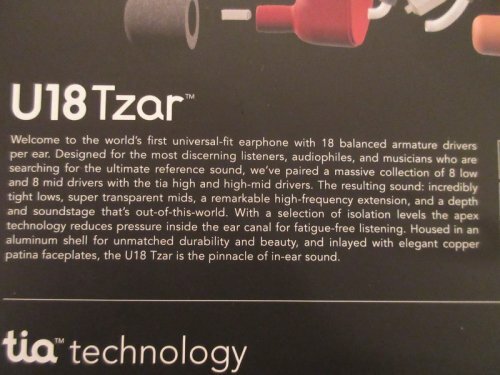 Reading and hearing about the U18 Tzar, I was skeptical about the decision to have only 1 driver out of 18 strictly dedicated to highs (there is a mid-high driver in addition to the tia high), but all my skepticism was quickly quieted after listening for about 30 seconds. I am beyond impressed with the U18’s sound. The signature is essentially flat throughout the entire spectrum, and yet each instrument is easily picked out. Although non-fatiguing, the U18 is still super energetic, and feels almost as if everything is forward. Each frequency range shines, and each instrument is given the opportunity to shine. 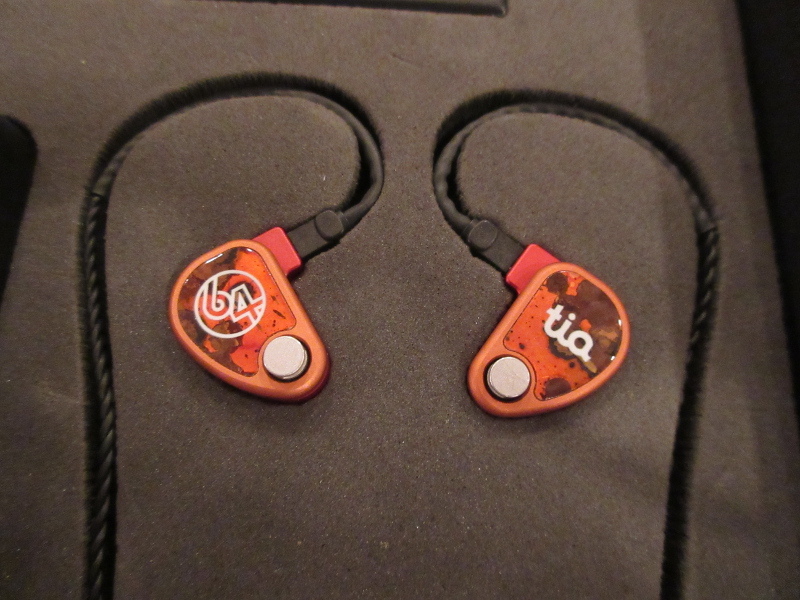 I will say it again: tia is the future of IEMs. That being said, I am glad the tia high was included in the U18 Tzar. 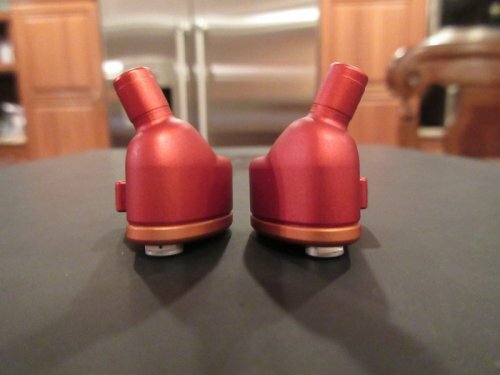 There is a major debate in the audiophile community: “does more drivers equate to a better IEM?”. In my general experience, more drivers generally means better IEM, but there are of course exceptions (such as most of Ken’s Campfire Audio lineup, and a few others). There is zero question that the 18 driver U18 has the most detail of any IEM I have ever heard. It is the 18 drivers that equate to that level of detail, even though the U18 is only a four-way crossover. Because the U18 is a four-way crossover IEM, it allows many drivers to be producing sound for the same frequency range, meaning that there is a ton of detail. As I said previously, I am hearing new aspects of my music in the bass range. The background vocals (which mainly fall into the lower-mid range) are the most detailed I have ever heard. Highs are textured and super detailed. Also keep in mind that in addition to the entire frequency range being incredibly detailed, it is also incredibly textured. I am not missing any detail, nor any texture. Instrumental separation is something else. I have never ever heard separation to this level. Every single detail, instrument, or even really subtle hand tapping comes out clearly and distinguishably. Again, it is the 18 drivers of the U18 that really make it possible to accomplish this level of separation, which is the argument for more drivers. The soundstage on the U18 is very interesting. It is incredibly long and wide, and above average for height. It is the combination of instrumental separation and soundstage that play heavily into the U18 sounding so realistic. Of course, soundstage will be elaborated upon during comparisons. Isolation on the U18 is actually really good, which is surprising due to the APEX system installed, which essentially gives the IEM a more natural, open, and bigger sound by releasing pressure from the IEM. When music is playing, no sounds get through, and I am only left with my thoughts and music, which is the way it should be. 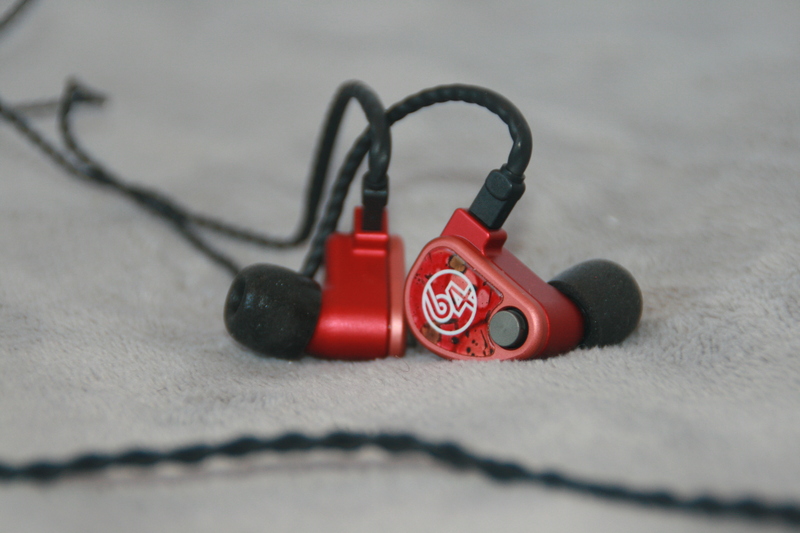 The U18 is very light, and surprisingly compact for an IEM with 18 drivers in it. Additionally, the I have no problems with the fit, as the U18 fits comfortably into the ear and sits nicely. With some IEMs, I can adjust the fit and get a different sound due to ill fit. I can not do this on the U18. Because of how light and how well the U18 really fits, I have no comfort issues with the U18, and can enjoy long listening sessions. The only potential issue I have come across is their premium cable. Depending on how the IEMs are worn, the braided portion of the cable can rub against your skin, irritating the area of contact. Instantly you can tell the sound quality on the Katana is much worse than that of the U18. The U18 has much more textured mids, highs, and vocals. The U18 also is much better detailed than the Katana. The U18 is much more neutral and sounds more natural. The soundstage on the Katana is wider and longer than that of the U18. We come to the question about price: with the U18 priced $1000 USD higher than the Katana, is it worth the extra cash? Undoubtedly. In my opinion, the U18 makes a mockery of the Katana. The Katana is a worth opponent to the U18, but it just does not compare in terms of sound quality or detail. The only place it has a leg up on the U18 is soundstage. Fit is better on the U18 as well. It’s actually quite shocking how much clearer the U18 is when directly compared to the Katana. The Katana does have a bit more sub bass rumble than the U18, and is for sure considered colored when compared to the U18. I have chosen to compare these 2 IEMs as they are both praised for their highs due to their technology. With the Andromeda in my ear now, I can tell sound quality is much worse than that of the U18 in almost ever aspect. The highs are comparable, but in the end, it is very clear that the highs from the tia driver in the U18 are much clearer, more textured, and better than that of the Andromeda. As for the rest of the frequency range, there is no competition: the U18 destroys the Andromeda. Where this comparison gets tricky is in pricing. The U18 comes in at $2999 USD, while the Andromeda comes in at $1099 USD. Is the U18 worth $1900 USD more? In my opinion, it undoubtedly is. I do have to give major props to Ken at Campfire for creating such an amazing IEM as such a great price though. While the Andromeda is by no means a bad IEM, it is just outdone in every way by the U18. I am yet to write my review of the Andromeda, but it will undoubtedly be very positive, as I really do like the Andromeda. The fact that I so strongly prefer the U18 over the Andromeda shows how amazing the U18 is. In terms of detail, the U18 kills the Andromeda. I can sit here for another 20 minutes writing about how the two compare, but instead I’ll just say this: if you think of a category and want to compare the two, in every category but price, the U18 is better. Right off the bat, you can notice a major shape difference between the two. The U18’s body fits into the curvature of your ear, while the Fourté does not fit as tightly. The Fourté has a thicker body, surprising, as it also has 14 less drivers than the U18. The nozzle on the Fourté is longer as well. The sound quality on the Fourté is not quite as good as the U18. The Fourté is not as neutral as the U18, being a bit darker. With there being more bass on the Fourté, it is clear the U18 is the less colored of the two. With both having the tia high driver, highs are incredibly on both. Instrumental separation and detail on the U18 is better, however, the soundstage of the Fourté is incredibly large, and sounds almost like full surround sound speakers do. I am lacking that full surround sound on the U18, but I have never heard it quite like I am on the Fourté. I attribute this full soundstage to the 4 tia drivers that pump out the music of the Fourté. The vocals are clearer/more realistic on the U18. Overall the Fourté is a more musical choice, while the U18 is a neutral analytical choice. While I did put money up for both units, I will not be selling either one. I can’t pick a favorite; they are just so different from each other. Honestly, you have to pick for yourself. As always, try to hear before you purchase. While many can’t validate spending this kind of money for an IEM, I believe 64 Audio’s asking price is pretty fair. 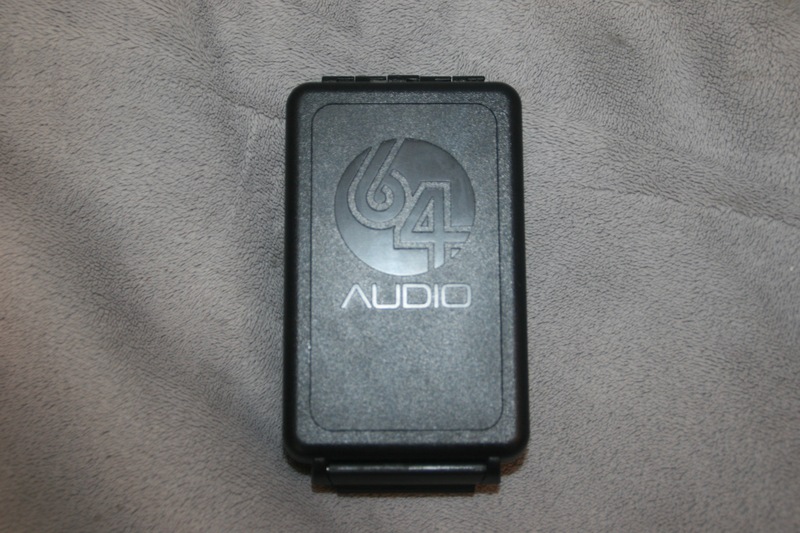 I would love to see 64 Audio produce a U18 in a cheaper housing, and selling it for cheaper for an alternative look (and briefly talked to Chris about this at CanJam). With almost every aspect of these IEMs being perfect, I had to get super nit picky in terms of finding something negative about the U18. 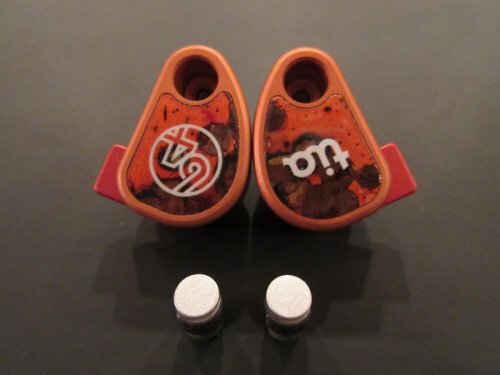 If you are looking for an end of game IEM, the U18 might be the answer to your search. junix, ehjie, ysyung and 6 others like this.